The biblical story of the Tower of Babel is believed by many to be the record of a real historical event that took place after the worldwide Flood, at a time when the earth’s population still lived together in one place. The enduring archaeological question, therefore, is where the Tower of Babel was built. It is widely considered that Shinar, where the Bible says the Babel event took place, was a territory in south Mesopotamia; and that Babel was located at Babylon. However, an analysis of history, geography, and geology, shows that Shinar cannot have been in the south, but rather was a territory in what is northeastern Syria today; and that the remnants of the Tower must be located in the Upper Khabur River triangle, not far from Tell Brak, which is the missing city of Akkad. After the biblical Flood of Genesis 7–8, Noah and his family came out of the Ark in the mountains of Ararat to start new lives in a strange world. Genesis 11:2 says that they eventually settled in a plain in Shinar; according to the Jewish historian, Josephus (1736a) (Antiquities 1:4:1), this was the first place where the multiplying group of people lived after leaving the mountains. In Shinar they rebelled against God and set out to build a city and tower to make a name for themselves and keep from scattering (Genesis 11:4). Our search for the Tower of Babel will therefore begin by locating the land of Shinar. The word that is translated “Shinar” in our Scripture is often assumed to be the Hebrew form of this place name, but this is not necessarily the case, since Shinar was not a land where Hebrew was the local language. As we shall see further on, the language spoken in Shinar was one of the rather large family of related Semitic languages, of which Hebrew is a member, all with their own slightly different spelling variations of words. Ancient languages such as Akkadian and Chaldean were Semitic; Assyrian, Aramaic, and Arabic are included in this group as well. (See Rendsburg 2003, pp. 71–73, for a discussion of the ancient Semitic languages.) These Semitic languages were spoken in many parts of the ancient Middle Eastern lands. The many Semitic languages, plus transcription from their writing systems, would also account for the claimed spelling variations of “Shinar.” Some versions of “Shinar” are Sanhar (Dillmann 1897, p. 353); Shanhar (Pritchard 1950, p. 247; Zadok 1984); Sanhara (Gemser 1968, pp. 35–36); Sangara, Singara, Sinar, Sanhar, Sangar, Sanar (Albright 1924); plus Senaar in the Brenton LXX, and Sennaar in the NETS LXX.1 This is not an exhaustive list, but it makes the point that when dealing with the ancient Middle East, a place name can hide out under various spellings. We will have further occasion to refer to Semitic language variations of place names in this paper. This author considers that what makes the most sense would appear to be the suggestion that “Shinar” is simply a Semitic language form of “two rivers” (in Hebrew, “shene nahar”) (for example, Rollin 1836, p. 284; Smith 1948, p. 622). Shinar, then, would be “land of two rivers,” a name closely related in meaning to the Greek, “Mesopotamia.”2 We would therefore look for Shinar somewhere in a territory that includes two rivers. Shinar would not necessarily have been a specific country, although it appears to be referred to in that way in Abraham’s day in Genesis 14, where one of the kings that came against Abraham was Amraphel, king of Shinar (we will mention Amraphel again later on). We cannot say for certain where the borders of Shinar in Amraphel’s time were. One of the difficulties with kingdoms of the Middle East in ancient times was that often there were no permanently defined borders, but the territory that a certain ruler governed could expand and contract over time, depending on his city’s power and on treaties signed with other rulers nearby (Ristvet 2008). This concept is not always understood today because the dividing up of the land of Israel among the Jewish tribes did involve set borders that did not change, as God instructed them (Joshua 12–19); this was in contrast to the custom of the peoples around them. The Daniel reference to Shinar is interesting. When Nebuchadnezzar took part of the vessels of the house of God from Jerusalem and carried them into Shinar “to the house of his god” (Daniel 1:2), where did he take them? Since Nebuchadnezzar was king of Babylon, and lived in the city of Babylon, it is unlikely that this place in Shinar was the same place as the city of Babylon, or the biblical narrative would have simply said so (it does in 2 Chronicles 36:5–7). We would expect that Shinar would have been a place somewhere in his large kingdom that Nebuchadnezzar visited on the way back home to the city of Babylon; as we will show later, Shinar was a territory that was largely in the area of northeast Syria. However, we can only speculate where this “house of his god” was in Shinar; the biblical author clearly assumed that everybody knew where this was and did not find it necessary to state it in the text. One possibility is that Nebuchadnezzar left the booty at a northern temple of the god, Marduk (or Merodach, Jeremiah 50:2, KJV), also called Bel, who was the supreme god of the pantheon at the city of Babylon at this time in history (Oates 1979, p. 105). There is evidence of worship of Marduk in the north; for instance, ancient Ebla, in the northwest of Syria, is called “Tell Mardikh” (another spelling of Marduk) even today (Finegan 1979, p. 43). From the eighth century BCE the cult of Nabu is widely attested among the Aramaic-speaking population living in Syria . . . . The god enjoyed great popularity . . . particularly in northern Syria. Also, in the ancient Turkish city of Edessa, now called Sanliurfa or Urfa (Grant 1997, p. 229), Nebo was one of the main two gods from very early times. (Drijvers 1980, pp. 40–75) says that “Nebo holds the first place and evidently is Edessa’s most venerated god.” Sanliurfa is in a plain about 50 km (31 miles) north of Harran, just north of the Turkish border, east of the Euphrates River (Heritage 2004, p. 143). This puts Sanliurfa within Shinar, and we therefore could consider it as a candidate for the place in Shinar where Nebuchadnezzar might have left his loot. Nebuchadnezzar actually did take some of the vessels of the house of God at Jerusalem back to the city of Babylon on another marauding trip (2 Chronicles 36: 5–7). We know that the Bible describes two different expeditions to Jerusalem by Nebuchadnezzar because the first one took place in the third year of Jehoiakim’s reign in Judah (Daniel 1:1), and the second took place after Jehoiakim had reigned for 11 years (2 Chronicles 36:5). Those who miss this detail make the mistake of claiming that Daniel 1:2 proves that Shinar must be an area including the city of Babylon (as does Albright 1924, for example). There was also a third plundering trip to Jerusalem by Nebuchadnezzar, as detailed in 2 Kings 24:13, when Jehoiachin was king. This time Nebuchadnezzar gathered up everything that he had missed previously, from both the temple and the king’s palace. In addition to more vessels, this lot included some big items that he cut up to cart them off; these probably included the pillars, sea, and bases that Solomon had made for the temple, that Jeremiah 27: 19 tells us about. We hear about all those temple vessels later on when Belshazzar gave a great banquet in the city of Babylon and commanded that they be brought out for his guests to drink from (Daniel 5:2–3). In addition, we note here that in Ezra 1:7–8, King Cyrus had the vessels taken by Nebuchadnezzar from the house of the Lord in Jerusalem brought out and counted to Sheshbazzar, the prince of Judah. Cyrus had made a proclamation throughout his entire kingdom, asking who of the captivity would like to go back to Jerusalem to build the temple there (Ezra 1:1–6); these vessels went with these people back to Jerusalem. The passage says that Nebuchadnezzar had put this temple treasure “in the house of his gods” (Ezra 1:7 KJV), or “house of his god” (Ezra 1:7 Brenton and NETS). If “his god” was Nabu, as discussed earlier, there was a major temple devoted to this god at Borsippa, just 18 km (11 miles) southwest of the city of Babylon (Borsippa 2010), and this could have been where this part of the booty from Jerusalem had been kept. However, nothing is said specifically about the part of the temple booty that had earlier gone to Shinar, nor is it specified that these vessels were all from the area of the city of Babylon, either. There is the possibility that the Shinar portion was included in the count and went back with those of the captivity who had been living in that northern area. There is also the question of whether it is the city or the kingdom of Babylon that is meant in some biblical and other historical references. There is also the question of whether it is the city or the kingdom of Babylon that is meant in some biblical and other historical references. Indeed, many verses mentioning Babylon could be quoted, that could refer to the kingdom as a whole and not just to the city itself. For instance, Isaiah 39:6–7 says that everything in the king’s house would be carried to Babylon, but the context of the chapter shows that “Babylon” refers to the kingdom, and not necessarily just to the city. Also, in Ezra 6: 1, 2, Darius ordered his people to look for the roll containing Cyrus’ decree to build the temple at Jerusalem; the search was to be made “where the treasures were laid up in Babylon.” The roll they wanted actually turned up in the palace at Achmetha (Ecbatana, now Hamadan), in the province of the Medes (Iran today), far from the city of Babylon itself, although the province of the Medes was part of the far-flung kingdom of Babylon at that time (Heritage 2004, p. 148; Yamauchi 1990, p. 305). This location for the scroll actually makes sense, because Cyrus had made Ecbatana his annual summer capital, and he could well have made this decree while staying there (Mitchell 1991, pp. 426–427). In another example, the Babylonian account of a campaign by the Hittite king, Mursili I, said that he went against “Shinar” (Sa-an-ha-ra). However, a Neo-Hittite document about the same campaign said it was against the country of “Babylon” (Kalimi 2000, p. 1213). We see in this example that Shinar was named as a territory in its own right in the one account, but was considered as part of the Babylonian empire in the other account. Because the Hittite kingdom was located in the north, largely contained in what is western Turkey today (Hittite Period, 2006), the area of Shinar would have been right next door and would have been quite convenient for making a campaign. However, because scholars have assumed a priori that Shinar is the area around the city of Babylon in the south (as we shall see), the biblical texts that mention Shinar are often quoted to show that they refer to the city of Babylon, which is a form of circular argument. Genesis 11:2 (KJV) says that Noah’s descendants migrated “from the east” to reach the plain in the land of Shinar. However, a list of 14 translations of Genesis 11:2 online splits evenly between translating this phrase “eastward” and “from the east” (Parallel Translations 2010); in addition, both the Brenton and NETS LXX translate “from the east.” These translations all appear to indicate that the Ark and Babel were east-west of each other. However, the New American Bible reads, “While men were migrating in the east” (Genesis 2009), and the Good News Translation reads, “As they wandered about in the east” (Compare Translations 2010). These last two translations offer a convenient way of circumventing any geographical problems because there is no direction of migration actually indicated; Faber (1816, p. 374) quotes ancient sources on this. In any case, the entire territory involved in the migration would have been eastward of Israel, whatever translation is preferred. The map of Mesopotamia (fig. 1) shows that, whether one believes the Ark to have landed on Mt. Cudi or Mt. Ararat,4 Babylon is hundreds of kilometers directly south of both of these places. Various authors have pointed this out, for example, Fraser (1834, pp. 217–218). This somewhat inconvenient geographical fact (for those who believe that the people migrated eastward or westward) is downplayed by those who believe that the Tower was built at the city of Babylon, and requires inventing scenarios that move the people far enough south while still satisfying their perception of this Scripture. One explanation is that Noah’s family left the Ark and migrated eastward (through the mountains) into Iran, then southward, and then westward (again through the mountains) toward Babylon (see Faber 1816, pp. 372–376, for discussion on this). Cornuke (2008), a well-known Ark enthusiast, solves this problem slightly differently by searching for the Ark on various mountains in Iran; in his view, the people would then have migrated south and west through the mountains to Babylon. Fig. 1. This is Mesopotamia, the land between the Tigris and Euphrates rivers. The area between the rivers is almost entirely in Iraq, except for a small portion in the upper left corner that is in Syria, and some territory in Turkey (part of this most northern area is not shown on the map). Shinar was a land in the north of Mesopotamia in biblical times; a section of the Khabur triangle (see fig. 3) appears in the very top left corner. The dotted line is the escarpment that marks an ancient shoreline, dividing the north from the south. The Tigris and Euphrates join at the bottom right corner to form one river, the Shatt al Arab, that flows into the Persian Gulf (Iraq 2003). However, almost all sources, whether biblical or secular, have placed the land of Shinar somewhere in the southern half of Mesopotamia (southern Iraq) (for example, Levin 2002; Stewart 2003, pp. 40–41; Walton 1995). The traditional belief, therefore, has been that Babel, where the Tower was built, and Babylon, the infamous city, shared the same name and were located in the same place (Benner 2006; Bromiley 1979, p. 382; Brown, Driver, and Briggs 1907, p. 93; Cheyne 1899, pp. 409–412; Henry 1992, p. 25; Kidner 1967, pp. 110–111; Kitto 1904, p. 84; Leick 2002, p. 245; Mackintosh 1972, pp. 56–58; Oates 1979, p. 60; Ross 1985, p. 44; Smith 1948, p. 71). Indeed, Cooper (1995, p. 177) claims that an ancient meaning of Babel/Babylon is “the place of canals”; he therefore puts forth his somewhat novel suggestion that Babel/Babylon also meant “the place of division” or even “the place of Peleg.” Halley (1965, p. 83) says that after the work on the Tower was stopped, those who remained in Babylonia eventually finished the Tower, which became the center around which the city of Babylon was built. Creationist Holt (1996) accepts that Shinar was in the south in his argument that the low elevation of southern Mesopotamia was significant in determining where the Flood/post-Flood geological boundary should be. Lasor (1988, p. 481) quotes every view he can find, admits that putting Shinar in the south doesn’t really fit all of the evidence—but ends up concluding that it was probably in the south anyway (!). There are those who have preferred a compromise position on the question, saying that, although the territory called Shinar originally (in a restricted sense) occupied only a northern part of Mesopotamia, eventually it was stretched to include the south as well (Fraser 1834; Rollin 1836). Wells (1820, pp. 114, 133) took a slightly different view and defined Shinar as a valley that ran north–south along the Tigris River, running from the “Armenian” mountains of Turkey in the north right down to the Persian Gulf. This allowed him to recognize that the “Sinjar” name of the mountains and city in the north of Iraq was probably a form of “Shinar,” but at the same time to claim that Babel was definitely the same place as Babylon in the south. Some have chosen other places in the south where the Tower of Babel might be, making the case that “Babylon” was a title sometimes applied to other cities (Dalley 2008). An example is the ruin called Birs Nimrud at Borsippa (about 18 km [11 miles] southwest of Babylon), an attractive candidate because it even carries Nimrod’s name (Halley 1965, p. 83; Jones 1897, pp. 3–4; Lowy 1893, pp. 229–230). The ancient city of Eridu in South Mesopotamia is conjectured by many as the original Babylon of Babel fame because of its age, its large, ancient ziggurats, and similarities between the cities (for example, both Eridu and Babylon had temples called Esagila) (Rohl 1998, pp. 222–223). There had also been a long period when scholars believed that Shinar was the same name as Sumer (territory of the Sumerians in South Mesopotamia) (for example, Hastings, Davidson and Selbie 1902, pp. 503–504; Jastrow 1915, p. 3), and worked diligently at showing linguistically that the two were equivalent (for example, Barton 1923). Equating Sumer with Shinar was a natural assumption, as noted by Potts (1997, p. 43), because, from a geographical point of view, this was quite convenient to the belief that Shinar had to be in the south, along with the Tower of Babel. Some, like van der Toorn and van der Horst (1990), just dithered. Zadok (1984) argued that Shinar could not derive from Sumer. However, the idea that “Shinar” is derived from “Sumer” persists (see Aling 2004; Koutoupis 2009). A theory that enjoyed a long period of popularity was that Amraphel of Genesis 14 was the same person as Hammurabi, sixth king of the first dynasty of the Old Babylonian Kingdom (see Pinches 2010, for example). Those who accepted that these two men were the same person could therefore say that, because Amraphel was king of Shinar, therefore Shinar had to be Babylon. (They do not question why the Bible would say “king of Shinar” rather than “king of Babylon.) However, there were persistent problems with this identification. Albright (1924) argued that, although both Amraphel and Hammurabi were names that clearly were of Amorite origin, attempts to make the two names equivalent required linguistic manipulation that was not really possible. Another difficulty was inherent in attempts to work out the necessary chronology that could put these two men in the same time frame. According to the biblical narrative, Amraphel lived in the time of Abraham; the events of Genesis 14 would therefore have taken place around 1900 BC by the biblical timeline of Jones (2007, p. 24) (this was some time after Abraham’s migration into Canaan). Determining when Hammurabi reigned has been the subject of considerable disagreement among scholars, and it is possible that no other ancient king has been assigned such widely varying dates in history. Goodspeed (1902, p. 109) gave Hammurabi a date of about 2300 BC for the beginning of his reign, but that has been reduced; most scholars currently put him somewhere around 1700–1900 BC (Oates 1979, p. 24). However, these dates are based on the inflated standard Egyptian chronology (the subject of revision of this Egyptian timeline will be discussed further on in this paper). Velikovsky (1999) makes a good case for putting Hammurabi somewhere in the sixteenth century BC; this is supported by archaeological finds in Crete that place Hammurabi in the time of the twelfth dynasty (Nilsson 1928, p. 385; Pendlebury 1930, p. 4).5 Hammurabi therefore would have reigned about 350 years after Amraphel. There are some who have attempted to bring Hammurabi all the way down to the tenth century BC to make him contemporary with David and Solomon (as argued by Hickman 1986), but this author considers this drastic reduction rather unlikely. In any case, the conclusion is that there is little likelihood that Amraphel could have lived at the same time as Hammurabi. Some early voices had dissented from the idea that Shinar was in the south. Fraser (1834, pp. 216–217) opined that putting the Tower of Babel in the same place as Babylon (Fraser refers to Beke 1834, pp. 24–26) was a novel idea and “an erroneous notion” because then Ararat would have been north of Babel and not east of it. Later on, Albright (1924) wrote a paper to show that Shinar was basically the ancient kingdom of Hanna, a territory in Northern Syria, bordered by the Euphrates on the west. Gemser (1968, pp. 35–36) thought that “Sanhara . . . seems to have been one of the four major powers in Northern Syria after the fall of the state of Mari.” We will further discuss locating Shinar in this northern area later on in this paper. Some have rejected the traditional views altogether, and have looked to more unusual places for the Tower of Babel. Wyatt believed that the Ark was the geological formation at Durupinar near Mount Ararat (Fasold 1988, pp. 3–10); he therefore went westward from there and claimed to find the Tower of Babel on the Euphrates River about 150 km (93 miles) north of Harran. This site is now under water because of the huge Ataturk Dam that was built by the Turks and completed in 1990 (Ataturk Dam 2010; Wyatt 1995; Ron Wyatt 2010). (For a map showing this location, see Wyatt n.d.) Michael Sanders announced discovery of the Tower on the southern coast of the Black Sea, based on NASA (National Aeronautics and Space Administration) photos and ancient biblical texts (Grimston 1999). Setterfield (2010) suggests that the biblical Shinar could be in the Sudan of Africa because there is a place called Sennar or Sinnar there. This region, with a capital city of the same name, and standard Arabic as the official language, lies between the White Nile and the Blue Nile and is therefore a “land of two rivers”; the northern part, where the two Niles approach each other, is even called “El Gezira,” which means “the island” in Arabic (East Africa 2004, p. 82; Northern Africa 1962, p. 121; Sennar 1911; Sennar, Sudan 2009). The similarity in geography of this Sennar/Sinnar to the territory that is called El Jazira today in northern Syria/Iraq is striking, and the similar place names cannot be a coincidence; the African location is probably named after the one in Mesopotamia. Although this paper takes the view that the biblical story of the Tower of Babel tells of an event that literally happened in early times, exactly as written, it should be noted here that there are many who believe that the story of Babel was inspired by the great ziggurats of southern Mesopotamia, and was written down later in history. Woolley (1928, p. 142) said that the ziggurat of Babylon was “the ‘tower of Hebrew legend’.” Both Parrot (1955, p. 17) and Siff (2006) also pick the ruins of this tower, named Etemenanki, located in the great Esagila temple complex of Marduk in Babylon, as inspiring the Tower of Babel narrative, claiming that most scholars now believe this. All of these writers therefore place the Shinar setting of this “tale” in the traditional south of Mesopotamia. As noted above, some sources place Shinar in the north of Mesopotamia, and not in the south along with the majority view. But if Babel and Babylon really are the same place, as most people believe today, the question is how Shinar could possibly be in the north at all. Indeed, how could Babel be any place other than at Babylon? An examination of the names “Babel” and “Babylon” is in order. The meaning of the name, “Babel,” is defined right in the Genesis passage as “confound” (Genesis 11:9 KJV), which, in turn, is defined in Webster’s dictionary as “confuse” (Webster 1973, p. 383). This author believes that a clear and straightforward reading of this verse and application of the principles of solid hermeneutics do not leave room for any other meaning (for more on literal biblical interpretation, see, for example, Habermehl 1995, pp. 5–18). Indeed, the English translations of the Septuagint Scriptures do not use the word “Babel” at all, but simply translate the name of the place where the Tower was built as “Confusion” (NETS and Brenton LXX, Genesis 11:9). The name Babylon—Akkadian Bab-ilim . . . ‘gate of god’—was long thought to be merely a translation of an earlier Sumerian name Ka-dingirra. But the city’s name is first found in the Akkadian form Bab-ilim, now believed to be a secondary spelling developed by popular etymology from an earlier name Babil, the meaning of which is unknown (Gelb 1955). Much later, the plural form Bab-ilani, ‘gate of the gods,’ is found. The modern name, Oates tells us, is the Greek form of Bab-ilani, hence Babylon. Interestingly, the modern ruins of Babylon are called Babil today (Leick 2002, p. 245). From all this we draw the conclusion that “Babylon” has a completely different linguistic origin than “Babel,” and a different meaning (gate of the gods) as well. This points out the error of those who say that “Babel” is translated “Babylon” (for example, Smith 1948, p. 71; Yates 1962, p. 16). The two names, “Babel” and “Babylon,” do appear identical in Hebrew in the biblical Masoretic manuscript, as BBL (for the actual Hebrew letters for this, which read from right to left, see Brown, Driver and Briggs 1907; Strong 1894, #894). This is because ancient written Hebrew of the Old Testament contained only consonants (although vowels were pronounced when Hebrew was read aloud); a written system of indicating vowels only appeared later on, in the Christian era. (For a history and discussion of this somewhat controversial subject, see Mitchell 2005.) When different words contained the same consonants, these words were distinguished from each other by the reader from the context, and their vowels were pronounced accordingly. This is why Babel was written as “BBL”; and since Babylon’s original name was “Babil,” it was also written BBL. Our various English translations from the Masoretic manuscript actually do distinguish between Babel and Babylon by translating BBL as “Babel” in Genesis 10:10 and 11:9, and thereafter (260 times) as Babylon. However, we need to understand that it is a linguistic coincidence that the same letters BBL are used to write both Babel and Babylon in Hebrew. Because scholars and theologians in recent times have somehow lost sight of this difference between “Babel” and “Babylon,” and believe that the two are one and the same (presumably because both appear in the ancient Hebrew as BBL), they therefore find it necessary to explain how “confusion” and “gate of the god” can both be correct meanings of the same word. The most widely accepted explanation is that there is a play on words in this passage, and many sources can be quoted that say this (for example, Ross 1985, p. 44; Yates 1962, p. 16). But there are other ideas. For instance, Harrison (1963, p. 89) informs us that Babylon is “the Greek form of the Hebrew word ‘babel,’ which was closely allied to, and probably derived from, the Akkadian ‘babilu’ or ‘gate of God,’” leaving out the “confusion” aspect altogether. 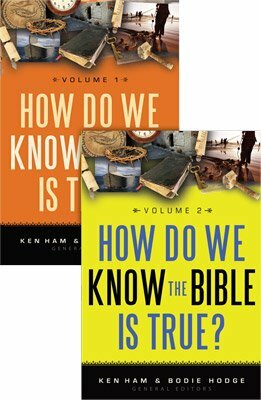 Howard (2009) has recently attempted to come up with a new way of solving this Babel/Babylon linguistic puzzle by claiming that “Babel” meant “the door of God,” so that Babel was the door through which God came down to earth to judge men; in this, Howard confuses the issue even more. In another rather novel view, Jordan (2007, pp. 99–100) quotes Hirsch (1989, p. 212f) to say that babel, related to balal (confound) is not meant at all, but that we should read yabal (wither). Since Jordan has already established (to his satisfaction) that it was primarily a religious division that took place at Babel (2007, p. 91), he concludes that over time false religions will lose the power to grip men’s souls and men will wither; the withering will then eventually lead to scattering. This last interpretation of “babel” shows how far it is possible to wander from the straightforward reading of the scriptural text. Our conclusion here, however, is that Babel and Babylon are different places, and are not necessarily located anywhere near each other. Since we know that the ruins of ancient Babylon, called Babil today, lie just north of the city of modern al Hillah (Hilla), capital of the Babil Governorate of southern Iraq, about 80 km (50 miles) south of modern Baghdad (Iraq 2003), this leaves us with the question where Babel in Shinar was. Because of the widely held belief that Babel must have been in south Mesopotamia, we will first take a look at this territory. In general, the geology of southern Iraq has been ignored by most biblical scholars and theologians, although there have been some exceptions. For instance, Fraser (1834, pp. 217–18) discussed the idea that immediately after the Flood, lower Mesopotamia could not have been inhabited, and the site of the city of Babylon must have been under water, quoting ancient writers Nearchus (c. 360–300 BC) and Pliny (AD 23–79). Beke (1834, pp. 17–24) argued the same at some length. Boscawen (1903, pp. 4–5) also noted that lower Mesopotamia was under water in ancient times and that this had led to what he called the “myth of the Deluge.” We will show here that it is entirely possible that the site of the ancient city of Babylon, along with a good deal of the southern alluvium of Iraq, was under water at the time that the descendants of Noah were building the Tower of Babel. If all the ice on land in the world today were to melt, the ocean level would rise to approximately what it was immediately after the Flood. There is an important geological feature in Iraq that runs roughly east–west from the Euphrates to the Tigris, north of Baghdad, from Ramadi (near Hit) to Samarra. This curving ridge or escarpment, about 6–15 m (19–49 ft) high, is located at an altitude of about 76 m (249 ft) and is considered to be an ancient ocean shoreline (Boesch 1939; Guest 1953; Held and Held 2000, p. 337; Lloyd 1955, pp. 16–17, 29; Maisels 1993, p. 87). The altitude of this ridge is significant because it sits right in the range of 70–80 m (229–262 ft) where the ocean shoreline might be today if all the global ice on land melted, as already noted. But nature has set a permanent mark, half way down the Mesopotamian lowland, by a difference of geological structure, which is very conspicuous. Near Hit on the Euphrates, and a little below Samarah on the Tigris, the traveller who descends the streams, bids adieu to a somewhat waving and slightly elevated plain of secondary formation, and enters on the dead flat and low level of the mere alluvium. The line thus formed is marked and invariable; it constitutes the only natural division between the upper and lower portions of the valley; and both probability and history point to it as the actual boundary between Chaldaea and her northern neighbor. There was no buildup of ice over Iraq during the Ice Age because the great ice sheet of Europe/Asia was far to the north (for a map showing the extent of this ice, see Oard 1993, p. 63). We therefore would not expect crustal rebound to be a factor in interpreting this ancient shoreline height (see Lambeck et al. 2000, p. 517, re crustal rebound). In addition, the entire area of Iraq (except the northeast corner) is included in what geologists call the Stable Shelf (described by Jassim and Buday 2006, pp. 57–70; also see the tectonic map of Iraq on p. 56); we would not expect appreciable uplift or subsidence to have taken place as a result of other geological forces. We could therefore conclude that this ancient geological feature may indeed have been the shoreline where the post-Flood waters settled after the earth dried out from Noah’s Flood, before the ice started to form. That there would have been a lot of water available from the melting of the ice is shown by the historical geology of the areas north and east of Iraq; during the Ice Age there were far more glaciers in the mountains of Turkey, Kurdistan and northeastern Iraq than the glacial remnants there today, as indicated by moraines left behind (see Kurter 1988, p. G2; Sarikaya, Zreda, and Çiner 2008; Wright 2004, pp. 215–216). Glaciers in central Turkey were extraordinarily large; one moraine in the Taurus mountains measures several hundred meters high and several kilometers long (Çiner 2004, pp. 423–424). However, we cannot state with certainty that the area of Babylon in the south was under the entire 80 m (262 ft) of water at the time that the early people started building the Tower (in the north, as we shall show), because there are a number of factors that can affect this figure, depending on the assumptions that we make. For one thing, the Bible does not say how long after the Flood that the people started building the Tower and City of Babel. Nor do we know exactly when the global ocean level started to go down because of ice buildup after the post-Flood equilibrium, nor how fast the water lowered. According to the commonly accepted Usshur chronology of the Bible (Usshur 1658, pp. 21–22), there are 106 years between the Flood and the Babel dispersion (this assumes that the dispersion took place at the time of the birth of Peleg). For the Tower to have been located at Babylon, the following events would have had to have taken place in that period of time: the ocean lowered more than 80 m (262 ft) because of continental ice buildup, the land area at Babylon dried up enough to build a major construction on it, the people migrated south about 600 km (372 miles), they started work on the Tower project, and then dispersed. This seems like a very unlikely scenario to have taken place within 106 years. The alternative LXX chronology allows 531 years from the Flood to the Babel dispersion/Peleg, but the current creationist Ice Age model as described above does not work for this timeline because the entire ice buildup would have taken place by the time of the Babel dispersion, with the meltdown already starting; we know this did not happen because of Neanderthals that have been found in widespread places where they had lived during the time of the thick ice (Habermehl 2010). Clearly a somewhat different model for the Ice Age would be needed to accommodate the LXX timeline, one that allows for a lot more time between the Flood and the glacial maximum. As of this writing, no Ice Age model for this timeline has been produced. However, from the foregoing discussion it appears that the Babylon site would most likely have been under water, perhaps quite a bit of it, at the time that the Tower project was under way. It is beyond the scope of this paper to go into further detail on this. Any modern map of Iraq offers an obvious clue to Shinar’s location in the north, because a form of “Shinar” appears in the name of the Sinjar Mountains lying just west of Mosul (this modern city lies directly across the Tigris River from the ruins of ancient Nineveh) (see fig. 1). Indeed, it was spotting the name of this mountain range on a map that initially inspired this paper on the location of the Tower. Geologists speak of the “Shinarish formation” of the Sinjar mountains (Kennedy and Lunn 2000). In spite of this, many scholars have been reluctant to admit that “Sinjar” could be a form of “Shinar” because of their certainty that Shinar could not possibly be in the most northern part of Mesopotamia (for example, Fraser 1842, pp. 96–97). When Smith (1893, p. 1281) said that “it is extremely doubtful whether there is really any connexion between Shinar and Singara or Sinjar,” he was voicing an opinion that would endure right up to the present time, as has been shown earlier. Fig. 2. 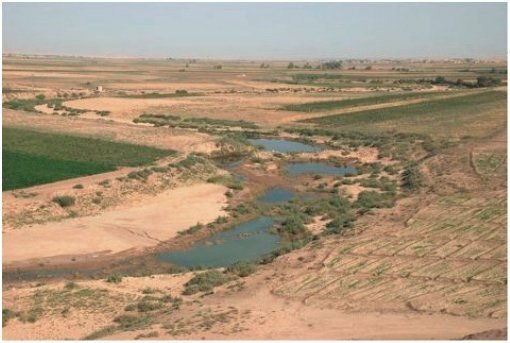 The flatness of the Shinar plain is shown in this picture of the Khabur River taken south of the city of Al Hasake, near Tell Sheikh Hamad, in North Syria. The Khabur triangle, as the upper part of this river is called, is somewhat north of this spot. Photo by Bertramz (Khabur River 2010). In view of historical and geographical facts there is much to be said for applying the name Mesopotamia to the country drained by the Khabur (River), the Belikh (River), and the part of the Euphrates connected therefore. We see from the foregoing that there is historical evidence that points to Shinar as a territory in the north of Mesopotamia, in Syria and Iraq, between the two great rivers, the Euphrates and the Tigris. Because we have shown that there is no connection between the names of Babel and Babylon, there is no reason to insist that Shinar should be extended to the south. It is difficult to tell from what we know of history exactly where the boundaries of the entire land of Shinar were; indeed, those boundaries may not even have remained precisely the same at different times. However, we will generally describe Shinar as a land including the territory that is located immediately south of the Turkish mountains between the Tigris and Euphrates rivers. This area is almost perfectly flat as far as the eye can see (fig. 2). It surely qualifies as “a plain in the land of Shinar,” as Genesis calls it. We will next examine this territory in northern Syria and Iraq for clues where the remnants of the Tower and its city might be located. According to Genesis 10:10, Nimrod’s kingdom in Shinar consisted of Babel plus three other cities: Erech, Akkad9 and Calneh (we might wonder whether these were originally founded by Noah’s three sons). Obviously, the memory of the location of these three cities as belonging to Nimrod’s original kingdom had been retained down through the ages right up to the time of the final editing of Scripture. Babel appears to have been the capital city of the four, constituting the seat of religion and government. The leaders and priests would most likely have lived at Babel (at least after it was finished), while the rest of the people lived in the other three cities. We can therefore picture Babel, Erech, Akkad, and Calneh clustered fairly close together on a flat plain in Shinar, perhaps with Babel in the middle and the other three around it. Today we would expect that there would be three tells,10 whether currently occupied or not, within a reasonable distance of the Babel site and each other; based on history, at least one of them would be major (Akkad, as we will discuss shortly). It is unlikely that these cities could have been 210 km (130 miles) apart as per Bonomi (1853, p. 42), or that Nimrod’s kingdom was as large as Vermont and New Hampshire combined as per Jones (1897, p. 51). Those figures are based on erroneous assumptions that the Babel cities were in South Mesopotamia. We will now move on to consider in turn each of the three cities that accompanied Babel, starting with Akkad because of its historical importance, then Erech, and then Calneh. The city of Akkad is mentioned only once in the Bible, in Genesis 10:10. However, we know a lot about Akkad because it figured importantly at one period of ancient history as the capital city of the great kingdom of Sargon I (Akkermans and Schwartz 2003, p. 278). So great was this kingdom in its time that Babylonian kings used the title “King of Akkad” for a thousand years after its fall (Leick 2002, p. 85). Sargon’s city of Akkad is commonly believed to have been located in southern Mesopotamia, somewhere just north of and adjacent to Sumer (Johns 1913, p. 14; Oates 1979, p. 11; Ragozin 1893, p. 1; Weiss 1975), perhaps in the environs of Baghdad (Arnold 2004, p. 23). These writers considered that Akkad was of course situated south of the geological ridge that separated North Mesopotamia from the alluvium of the south. There is possibly a very good reason why Akkad has not been found. As we have shown, Shinar was in Northern Mesopotamia between the Tigris and Euphrates rivers, and Akkad was a city in Shinar. It therefore follows that we should look for Akkad somewhere in this northern area, even though this goes against all current archaeological belief. From what we know of Akkad, its site has to be an ancient mound that, when excavated, should display evidences of remnants of government administration buildings, palaces, temples and other structures in keeping with the royal capital of the Akkadian period. Fig. 3. This is the Khabur triangle in northeast Syria, popularly called by this name because of the shape of the area outlined by the upper Khabur River and its tributaries. It is proposed in this paper that the three cities in Nimrod’s kingdom, Erech, Akkad, and Calneh, are at Tell Aqab (near Amuda), Tell Brak and Tell Fakhariya. The most likely place to look for the capital city, Babel, would therefore be somewhere in the middle of the triangle formed by these cities. The impression its power made upon the national imagination was so striking that we must postulate a long period of prosperity for the accumulation of the necessary material resources. It cannot have owed its sudden overwhelming supremacy to a fortuitous combination of political or economic causes: it must have long awaited an opening before it marched to empire . . . . It should be noted that not all historians agree with this statement about the pre-Sargonic history of Akkad; many claim that Sargon founded the city (which they believe was just a small settlement before that, at most), and that “all sources are unanimous” in this belief (Kuhrt 1995, pp. 44–45). However, if we point to Tell Brak as Akkad, these sources cannot be correct because of the obvious history displayed in its many earlier levels. Archaeologists agree that Tell Brak was an important city before Sargon’s time (which they call the Akkadian period), and have chosen the ancient city of Nagar as the most likely candidate for Tell Brak (Oates and McMahon 2008a). Their problem is that onsite evidence gleaned from excavation to support the identification of Nagar with Tell Brak is very limited. Not even the temple of Nagar’s famous goddess, Belet-Nagar, has been found so far on Tell Brak; this important regional goddess was Nagar’s main claim to fame (Eidem and Warburton 1996; Ristvet 2008; Veenhof and Eidem 2008). In addition, Nagar continues to be mentioned in the texts during and after the time of Akkad’s importance (Ebeling, Meissner, and Edzard 2001, pp. 74–77; Oates 2004). This would suggest that if Brak is indeed Akkad, Nagar must be another mound in the area. As is often the case, identification of ancient cities seems to be more a matter of scholarly consensus than actual evidence, and the certainty of an excavated city’s historical name can be questionable. Vaux (1855, p. 12) was honest about this: “Hardly any evidence, except the reading of the names on bricks or monuments found in the respective localities, can be deemed a satisfactory proof that the ancient site has really been discovered.” The situation is not much different today. A given site is considered to be “probably” a certain ancient city; after scholars have said “is identified with” often enough (this is a preferred scholarly way of saying “probably,”) eventually they drop the “probably.” This appears to be how Tell Brak came to be considered ancient Nagar by scholars today; an internet search on “Tell Brak and Nagar” will bring up any number of sources that simply state that the two are the same place (for example, see Eidem and Warburton 1996; Michalowski 2003; Oates and McMahon 2008a, where the article titles carry both names). We cannot overemphasize what an important location Tell Brak occupied in ancient times, situated as it was in north Mesopotamia in the Khabur12 river triangle (as the Upper Khabur area in Syria is commonly called), in the center of the main east—west route from the Mediterranean to Assyria (Semple 1919; Wright et al. 2007). It is small wonder, then, that Sargon’s grandson, Naram-Sin, claimed the title of “King of the Four Corners of the Universe,” sitting in the center of the known world as he did, looking in all directions (Spielvogel 2008, p. 9). Although Tell Brak is located at a site that does not offer much flowing water today, the nearby wadi Jaghjagh would have had a much greater flow in Sargon’s day (Wilkinson 2007); also, the Khabur river, into which the Jaghjagh flows, was wider, deeper and navigable then (Blackburn and Fortin 1994; Herz and Garrison 1998, pp. 24–25). This is a subject that arises with respect to historical mentions of the wharf of Akkad, at which boats from faraway places docked with goods (Stieglitz 1987, p. 45). Although Akkad had been very powerful in its day, it is not mentioned in the biblical prophecies of the first millennium BC; this is because long before this time Akkad had lost its importance, and was little more than a cult center by then (Kuhrt 1995, p. 45). What excavators are finding at Tell Brak and elsewhere in this part of Syria, northern Iraq, and southeastern Turkey, is causing them to reconsider what most scholars have historically believed, which is that cities and civilization first developed in the south of Mesopotamia and then spread from there to the north (see, for instance, Huot 1992; Sanders 2002; Van de Mieroop 1999, pp. 28–31; Wells 1922, p. 52). The advanced state of civilization indicated at Brak means that these long-held beliefs may have to be overturned, and historians may have to rewrite history to show that cities first developed in this northern area (Crawford 2004, pp. 115–129; Lawler 2009; Oates 2004; Oates et al. 2007) and only later on in the south. Another example of a difficult problem for secular archaeologists is an extremely early archaeological site being excavated in northern Mesopotamia at Göbekli Tepe (very close to Sanli Urfa in south Turkey, about 215 km (133 miles) northwest of Tell Brak); the temple complex, as they call it, is so ancient and at the same time so advanced that it does not fit at all into their carefully constructed view of our origins. This site, apparently dating from the end of the Ice Age, is perhaps the oldest in the world, predating anything else they know, and they simply don’t know what to make of it (Symmes 2010). The secular obsession with tracing a linear development of cities and cultures comes directly from the evolutionary worldview that requires that all archaeological information be fitted into a model that has man starting off as primitive (for example, a cave dweller) and evolving gradually “upwards” to being more civilized (for example, building cities) (Moore 1988). It is perhaps difficult for creationists, who have quite a different view of history, to comprehend this obsession, because they take it for granted that the earliest people on earth had a superior civilization, and “primitive” cave men lived only after the Babel dispersion, during the Ice Age (Oard 2004, pp. 127–129). In view of the geology of South Mesopotamia, where the land was very low in elevation and the alluvium newly formed after the Ice Age, we would expect that the territory there would not have been ready for habitation as soon as in the north. Earlier development of civilization in the north would therefore seem to make sense. However, this will not be an easy change of thinking for scholars to make, because the idea that civilization started in the south is well entrenched. We will conclude here that the first city of the Babel kingdom trio, Akkad, is most likely Tell Brak in north Syria. Erech is mentioned only once in the Bible, in Genesis 10:10. (Erech is spelled “Orech” in the Brenton and NETS LXX.) In addition, there is a reference to men from Erech or Uruk in Ezra 4:9 (KJV “Archevites,” LXX “Archyaeans”). This was at the time of the building of the temple in Jerusalem; a large number of people from different parts of the Babylonian empire had been transplanted earlier from their native areas to Samaria by Asnappar (Ezra 4:10). Both secular and biblical historians believe that “Erech” is linguistically the same name as “Uruk,” and that these are two forms of the ancient name of modern Warka in southern Iraq (for example, Duncan 1915; Fischer 2008, pp. 53–54; Leick 2002, p. 30; Loftus 1857, pp. 160–161). This rather complicates the matter of finding the biblical Erech, because it means that any mention of either Erech or Uruk in the historical literature could refer to a city that is located either in Shinar (near Tell Brak/Akkad) in the north, or that is synonymous with Warka in the south. The Archevites of Ezra 4:9 could have been from either place; at the time of the writing of the book of Ezra, no clarification was apparently needed. There are historical indications of a city in the Khabur triangle area in the north of Syria that could have been the biblical Erech. Called “Urakka” in various Assyrian sources, it is mentioned by Astour (1968, 1993), Olmstead (1921), and Postgate (1974). Urakka is shown on the online map of the Assyrian Empire (Parpola 1987), near the modern city of Amuda in Syria, almost on the Turkish border (see fig. 3). There is an ancient mound 6 km (3 miles) south of Amuda, called Tell Aqab, that could possibly be this Urakka; excavations carried out on Aqab show it to have roots in great antiquity (Davidson and Watkins 1981). Looking at Urakka/Aqab from the point of view of etymology, if the “Ur” is taken off the front of “Urakka,” “akka” is very close to “Aqab, making the equating of the two names plausible.”14 Another spelling variation of the same city appears to be Arakdi; this city is stated to be north of “Til Bari” (called Tell Barri today, located about 10 km (6 miles) north of Tell Brak), and was considered to be a fairly important place in the ninth century BC (Olmstead 1918). This would point to the same location near Amuda for both Urakka and Urakdi, and there would be reason to believe that Tell Aqab is the location of Erech of the Bible, again allowing for the many spelling variants of these names. To sum up, we will point to Tell Aqab, probably Urakka/Urakdi, near Amuda in North Syria, as the probable location of biblical Erech/Uruk. Calneh is mentioned twice in the KJV Bible, in Genesis 10:10 and Amos 6:2; in addition, it would appear that Calno of Isaiah 10:9 is the same city as Calneh of the other two verses.16a Also, Ezekiel 27: 23 mentions “Canneh”16b in the same verse as Haran, Eden, Sheba, Asshur and Chilmad (a list of cities whose merchants did business with Tyre). As we shall show, there may be good reason to believe that “Canneh” is the same place as Calneh/Calno; indeed, a survey shows that many scholars believe this (for example, Jones 1856, p. 81; Smith 1948, pp. 102, 105). These slightly differing spellings could well be Semitic language variations coming into play, as discussed earlier. This city in the Genesis triad has had to struggle for recognition of its very existence. In 1944, Albright published a paper in which he claimed to prove that the Hebrew word “Calneh” should be translated “all of them,” and that there actually was no such city in Shinar at all. According to him, Genesis 10:10 should read, “And the beginning of his kingdom was Babel, and Erech, and Accad, all of them in the land of Shinar.” Many scholars have followed this (see for example, Thompson 1971; and van der Toorn and van der Horst 1990 who lists a number of other scholars and biblical translations in agreement with this thesis). Other scholars have refuted the Albright view on various linguistic grounds (Westermann 1984, p. 517; Yahuda 1946), but this idea lives on (Levin 2002). Interestingly, in Amos 6:2, where the KJV reads “Calneh,” the Brenton and NETS LXX both read “all of you” instead of the city’s name; the LXX translators appear to have made the same mistake as Albright, even though both LXX versions had included the actual city’s name in Genesis 10:10 and Isaiah 10:9. This author suggests that the “thence” in the next sentence of Amos 6:2 (Brenton LXX) and the “from there” (NETS LXX) do not make sense if there is no city name in the preceding sentence for these to relate back to, and the LXX translators should have noticed this. In any case, the Brenton LXX leaves no doubt about the existence of Calneh with its rendering of Isaiah 10:9 (which is somewhat different than the KJV at this point): “Have I not taken the country above Babylon and Chalanes, where the tower was built? (Italics are the author’s.) And have I not taken Arabia,17 and Damascus, and Samaria?” (The NETS version is similar.) We can reasonably conclude that the “tower” of Isaiah 10:9 is the Tower of Babel, because we know that there was a Calneh very close to Babel from Genesis 10. The identifying clause about the tower was probably inserted to distinguish which city was meant, as there were possibly other cities at that time with similar names, as we shall see. Calneh is also shown to exist in the KJV rendering of Isaiah 10:9: “Is not Calno as Carchemish? Is not Hamath as Arpad? Is not Samaria as Damascus?” Gelb (1935) points out that these three pairs of cities lie in geographical order as the conquerors went westward from their home in Assyria toward western Syria. This puts Calneh in the position of being the first in line of these six cities that the Assyrians had attacked and destroyed, giving us a clue as to its location. What we know about this Calneh is that it must have been an important city some time before the time of the prophets Isaiah and Amos, because it is mentioned by them at the same time as other important cities—and both prophets mention Calneh first. A reading of the context of both passages, in Amos 6 and Isaiah 10, shows that what the prophets are alluding to is the destruction of all these cities, that had already taken place, and is using them as a warning that the king of Assyria would come and do the same to Israel. At the time of these two prophets, the destruction of these named cities would have been well known. In any case, one might wonder how all the scholars like Albright, who believed that Calneh should disappear in Genesis 10:10 as “all of them,” could ignore the later verses in Isaiah and Amos that only make sense by using the city’s name. It is this author’s suggestion that the Calneh of the Bible is Washshukanni (there are many spelling variations), capital of the powerful Hurrian kingdom of Mitanni (also called Hanigalbat), that rose to power some time around 1500 BC (Oates 1979, p. 207), according to the secular timeline (although the offered dates vary somewhat). Mitanni controlled a large area of north Syria and Assyria at its peak (Oppenheim 1964, pp. 399–400). The city of Washshukanni is generally believed to be somewhere in the Khabur triangle area, but most sources claim that this city has never been found. However, there are persistent indications that Washshukanni could have been located at ancient Tell Fakhariya, near Ras al Ain, west of Amuda/Urakka (see figs. 3 and 4). Moore (1978, pp. 183–184) concludes that Tell Fakhariyah goes back to earliest times (seventh millennium BC in the secular timeline). A city named Sikan(i) is believed to be Tell Fakhariya because of a statue with a bilingual inscription that was found there (Greenfield and Shaffer 2001, p. 217; Huehnergard 1986; Millard 2000, p. 115). There has been discussion among scholars as to whether the Assyrian “Sikani” could be a derivative of the Hurrian “Washshukanni” (for example, Millard 2000, pp. 114–115). Astour (1992, p. 7f) points out an itinerary that would have placed Washshukanni near Ras al Ain and Tell Fakhariya. We note also that Sikani is placed in this location at the headwaters of the Khabur river on the Assyrian Empire map (Parpola 1987). We now return to the earlier discussion of the various forms of “Calneh” that appear in the Bible, one of which is “Canneh.” The “kanni” at the end of “Washshukanni” could well be Canneh or Calneh of the Hebrew Scriptures. Geographically, a march westward across this northern territory would first bring the Assyrians to Washshukanni/Sikan/Tell Fakhariya (that is, Calneh) and then to Carchemish as per Isaiah 10:9, “Is not Calno as Carchemish?” We know that the Assyrians had conquered Carchemish in 717 BC (Miller 1996, pp. 173–176). Washshukanni was finally destroyed by the Assyrians around 1250 BC in the standard timeline (McIntosh 2005, p. 93). This would appear to make the destruction of Calneh hundreds of years before the time of the prophets; if this was true, Calneh’s destruction would hardly have been fresh in anyone’s memory in Isaiah’s time. The matter of determining an accurate timeline now becomes especially pressing. A study of ancient Middle East history shows that, over a couple of thousand years, cities rose and fell constantly, and a city that was very powerful at one time was in total ruins at another. If we are looking for a city that had been powerful, but then was completely destroyed before the era of the prophets, we need to be sure that we have the chronology right. One of the recurring timeline themes is that the accepted secular history of the ancient Middle East has to be reduced by at least 500 years; this is an idea that was first put forth by the much-maligned Velikovsky (1952), and has been a matter of discussion by various authors since (for example, Courville 1971; Henry 2003).18 Subtracting approximately 500 years from the final destruction of Calneh/Washshukanni puts this event in the eighth century BC, bringing it fairly close to the period of Amos and Isaiah (Ussher 1658). This author suggests that this would be about right for the time period that we would expect for Calneh’s destruction. Fig. 4. Tell (el) Fakhariya, situated near the headwaters of the Khabur River close to the Turkish border, is considered by this author to be the likely location of Calneh. Scholars believe that this Tell could be Wassukanni, capital of the ancient kingdom of Mitanni; and also the later Assyrian city, Sikani. Photo: Sebastian Hageneuer (Tell el Fakhariya 2010). We will therefore conclude that Tell Fakhariya is the most likely location of Calneh, the third of the Babel trio of cities. Interestingly, some of the Jews who were taken into captivity may have been settled very close to Calneh, as Tell Fakhariya is only 2 km (1 mile) east of Tell Halaf;19 indeed, the captives may have been as little as 50 km (31 miles) from the site of Babel itself (see fig. 3). This now gives us three cities that occupy three points of a triangle in the area known as the Upper Khabur valley (see fig. 3). We might reasonably expect that the Babel Tower and City were somewhere inside this triangle, perhaps equally distant from Erech, Akkad, and Calneh. It is widely believed that the Tower of Babel was a ziggurat, also called a stepped pyramid; a quick search on the internet will bring up any number of sites that state this (for example, Livingstone 2008). There is good reason to believe this, because the many ziggurats that are known around the world20 clearly point back to a time when there was an original ziggurat, the knowledge of which traveled with people as they spread out to populate the earth. For creationists, who believe the Bible story in Genesis 11 literally, this original ziggurat has to be the Tower of Babel. The question is what this original ziggurat looked like. The ancient ziggurats in South Mesopotamia that we know today, widely touted as being most likely what the Tower of Babel looked like (and even that one of them was the actual Tower of Babel, as we have seen earlier), actually date a lot later than Babel.21 In any case, the Tower builders at Babel dispersed in all directions, taking their memories of the Tower design with them, and there is no support for saying that the ziggurats of south Mesopotamia looked more like the Tower of Babel than any others elsewhere in the world. The base of the Tower was most likely square, as were all the other, receding levels.22 With regard to the dimensions of the Tower of Babel, the Bible does not give us details of the Tower’s base size, nor of its planned height with the top that would reach “unto heaven” (Genesis 11:4). A plain reading of Scripture would lead to the conclusion that the tower was to be very high; this would mean that the base would have been quite large to sustain its height. There might have been a temple or shrine on top, since many ziggurats do have this, such as the ziggurat at Ur (Oates 1979, pp. 45–47). We also do not know how many able-bodied men were available to do the building work; estimates of the total population at the time of the dispersion have varied greatly, from under a thousand (Morris 1966) to 65,000 (Tower of Babel 2010), to name two. Whatever the number was, this author takes the view that the long-lived people at Babel were Neanderthals, and thus known to be physically very strong (Cuozzo 1998; Habermehl 2010; Trinkaus 1978); they would have been able to do much harder physical work than humans today. Fig. 5. The central part of the Chichen Itza complex of structures in the Yucatan Peninsula of Mexico is shown above (the Kukulcan Temple is the well-known Chichen Itza ziggurat, called “El Castillo,” the castle). The building of a “city” of this type along with a ziggurat tower has persisted for thousands of years around the world, supporting the Genesis story of the city and tower at Babel. Drawing by Holger Behr (Chichen Itza 2010). The builders at Babel were working on a city as well as a tower, as we see in Genesis 11: 4, 5 and 8 (note that the city was mentioned first in this phrase, all three times).23 Although most people focus their attention on the Tower of Babel in the Genesis story, we should not underestimate the importance of the attached city in the pagan kingdom that they were organizing. If we study the ziggurats everywhere in the world today, we see that they are almost never solitary structures. They are usually accompanied by a large number of temples, shrines, altars, palaces and other associated buildings, both religious and administrative, with the entire area enclosed by a wall. For instance, the Chichen Itza complex in the Yucatan Peninsula of Mexico illustrates this (see fig. 5). Other examples of these ziggurat/city complexes are the Esagila of the inner city of Babylon (Oates 1979, p. 148); the Chogha Zanbil ziggurat and nearby buildings in Iran (Chogha Zanbil 2009); and the somewhat more recent centers of the Pyramid of the Sun (Tompkins 1976, pp. 226–240) and the Pyramid of the Moon (fig. 6), both at Teotihuacan in Mexico. The huge multi-pyramid complex at Tucúme, Peru, built about 900 years ago (Heyerdahl, Sandweiss, and Narváez 1995, p. 78), and the lesser-known Dravidian temple compounds of south India with their ziggurat-like gopuram towers (see fig. 7), built as recently as 500 years ago (Das 2001), are also good examples. These geographically widespread pyramid complexes tell us that the custom of building this kind of religious and administrative center must be patterned after the original model at Babel. We would therefore look for remnants of a large number of structures that the people were building alongside the Tower itself at the Babel site. Fig. 6. 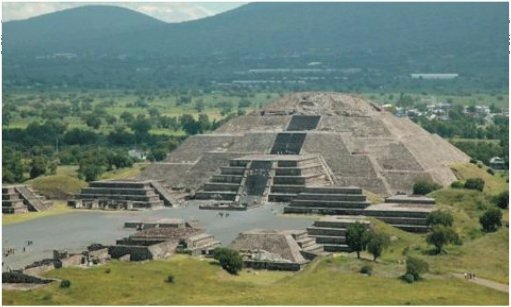 The Pyramid of the Moon in Teotihuacan, Mexico, is shown above with some of the structures that accompany it. Photo by Ineuw (Pyramid of the Moon 2010). According to Genesis 11:3, the Tower was built of “burnt” brick—that is, kiln-baked brick. This is a very durable material, and because of this, remnants of the Tower may well have survived the ages.24 The bricks were held together by “slime” or bitumen, and availability of this material was one of the reasons for building the Tower on the plain in Shinar, as noted earlier. The biblical comment that the Babel builders used burnt brick “for stone” (Genesis 11:3) probably reflected the tradition in ancient Israel of constructing major buildings of stone, as pointed out by Kenett (1995, pp. 18–19) with respect to the quality of Solomon’s temple (these stones are mentioned in 1 Kings 5:17, 67). Stones figured importantly in Solomon’s great palace as well (1 Kings 7:9–12). Mud bricks were used in Israel for other construction, as for instance, in the tells of Dan, Hazor, Megiddo and others (Schaffer 2000). There is one other thing that we need to look for, and that is ruins that are the oldest on earth (we assume here that all pre-Flood constructions were totally destroyed in the worldwide Flood). The subject of dating the Babel site can get quite confused if other means of dating are used, rather than the statements in the Genesis record. For instance, scholars generally believe that going back to 8500 BC (using the traditional secular time scale), only unbaked bricks were used for architecture, along with gypsum or mud as mortar; and that it was only later, about 3500 to 3000 BC, that baked brick and bitumen (which were expensive) came into use for luxurious buildings such as palaces, temples, and ziggurats. On this basis, the Tower of Babel would be dated by them to the period of the well-known ziggurats of southern Mesopotamia, thus posing another set of chronological problems to be solved imaginatively (such as explaining how there were many peoples living in various places, speaking different languages, at the same time that the Tower of Babel was being built) (see Seely 2001; Singer 1954, pp. 250–54; Walton 1995). Obviously, according to Genesis, the Tower of Babel had to have predated all other ziggurats; indeed, the Babel city and tower would date the same as the original cities of Erech, Akkad, and Calneh, with all of them being the earliest cities on earth. Fig. 7. 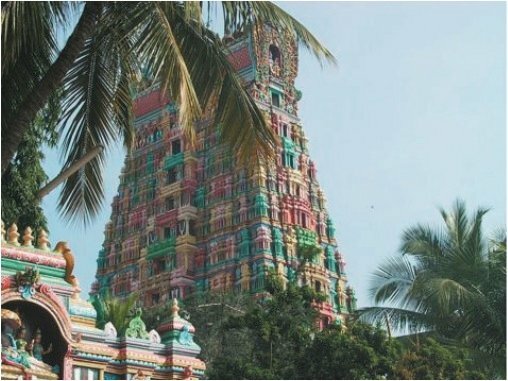 The showy gopuram towers of south India, that act as gateways to their Hindu temple complexes, display a recognizable ziggurat architectural style embellished by ornate Indian sculpture. The tower shown above belongs to the Srivilliputhur Andal temple complex in the town of Srivilliputhur, 74 km (46 miles) from Madurai, India; it is the one that is shown on the government seal of Tamil Nadu (Srivilliputhur Divya Desam 2011). The Khabur triangle area is in accord with the biblical story in every way, and it is easy to understand why Noah’s descendants might have found this an attractive place to settle. In ancient times there was more rain there than now, and the rivers of this area would also have been watered from the northern Turkish mountains and the springs in their foothills, even as they are now (Wright et al. 2007). Bitumen would have been readily available to the Babel builders. According to Moorey (1999, pp. 332–335), there is bitumen all over Iraq, Syria and also in Turkey; and this most northeastern corner of Syria is one of the country’s oil regions (Carstens 2006). There were oak trees in this region in ancient times (Deckers and Riehl 2007); these would have served for building material, as well as fuel to bake brick and process the bitumen. An alternative fuel could have been the bitumen itself; this is noted by Moorey (1999, pp. 333, 335). The center of this triangle of cities is roughly 160 km (99 miles) west and somewhat south of Mt. Cudi, the mountain considered by this author to be the most likely one where the Ark landed (Habermehl 2008). This would have been a reasonable distance for the people to have travelled to the spot where they decided to settle. However, if the ocean shoreline at the time was further south at the escarpment between Hit and Samarra, as discussed earlier, we see that the people did not choose to live near the seashore, as mankind has done in the many years since. We might wonder whether Noah’s descendants preferred to live inland because of memories of the Flood. One result of “moving” Babel from south Mesopotamia to the north of Syria is that secular historians will no longer be able to claim that the building of the Tower was merely a story inspired by the ziggurat at Babylon (for example, Parrot 1955, p. 17). Indeed, there are no other currently known ziggurats near the Khabur triangle area at all; the nearest known ziggurat is the one at Tell al Rimah (Karana), about 130 km (80 miles) to the east (Dalley 1984, p. 22). Those who might consider it likely that a land with many ziggurats (such as South Mesopotamia) would be a more probable location for the Tower of Babel (perhaps because the Babel tower would have inspired the later ones) should remember that the people were dispersed before the one tower that they were building was finished. It is therefore equally likely that the Tower would be found in a place where there are no other ziggurats located nearby. The memory of that original tower would have gone out from Babel with its builders in all directions, however, and we see this in the many ziggurats that were built later on all over the world. Of course, one major implication of “moving” Babel to the north is that this goes against the deeply entrenched belief that the Tower was built somewhere in the area of the city of Babylon in the south. New ideas do not gain ready acceptance, and it can be expected that this one will be no exception. Would We Recognize the Babel Site If We Found It Today? Because thousands of years have gone by since the Tower of Babel was built,25 we could expect that the remains would be in ruins today. The Bible does not say how much of the Tower had been built when God stopped its building, but clearly it and its city were not finished. In addition, there are extra-biblical stories that tell how God destroyed the Tower by wind, for example, The Book of Jubilees (1913) 10:26, and the Greek Sibyl as quoted by Josephus (19736a) (Antiquities 1.4.3). Although information from these sources does not carry the authority of Scripture, it does, however, leave open the possibility God destroyed a good part of the Tower. According to the biblical account, we would look for ruins that contain baked brick held together by bitumen. Genesis does not say whether these materials were used only for the outer walls, or whether they were used for the entire tower through and through; ziggurats of later times usually used the more expensive baked bricks only for the exterior, and then filled the interior with cheaper material such as mud brick (Saggs 1989, p. 57). However, from the wording of the Genesis account, the people planned to stay in Shinar and not scatter; this would imply that they wanted the tower to be a long-lasting structure. For this, they would need the baked brick to be used throughout, as it is well known that the mudbrick-filled ziggurats did not last and had to be repeatedly rebuilt (Saggs 1989, p. 57). If in later times the populace of the area looted the Babel site of bricks to use for their own buildings, there could be little of the Tower and City left, the taking of bricks from a deserted site for use elsewhere being a time-honored tradition in the Middle East. In Babylon, for instance, the fine baked facing bricks of the ziggurat Etemenanki of Nebuchadnezzar found their way into many peasant dwellings of the area (Leick 2002, p. 268). However, if Babel was considered a taboo site and not to be touched lest the gods got angry, or alternatively was entirely hidden by layers of silt, this looting of its bricks may not have happened. The earliest post-Flood people most likely possessed superior technology with respect to construction; this knowledge could well have come through the Flood from antediluvian times (Chittick 2006, passim). Thus, the Tower would have been built with the advanced building skills that those earliest people had. It does raise the question whether secular archaeologists today would even recognize the Tower of Babel site as being as ancient as it is, because its advanced technology would make them think it was an edifice from a more “advanced” civilization of later times. Their evolutionary worldview demands that the earliest structures be the most primitive (and in any case they do not believe that the Babel story is more than a myth inspired by later ziggurats). The spade of the archaeologist will be crucial in helping us find out more information about the area where Babel and the three cities of our triangle lie. One archaeological effect of the Gulf war and the continuing political unrest in Iraq, where traditionally a great deal of excavation had been carried out, has been to favor increased excavation in places like North Syria, because of the dangers of working in Iraq. Previous to that war, relatively little excavation had been done in the Khabur triangle area compared to the very large number of mounds waiting for excavation (with a few exceptions such as Tell Brak) (Akkermans and Schwartz 2003, p. 1; Crawford 2004, p. ix; McIntosh 2005, p. 43). However, other obstacles may lie in wait for those wishing to get a permit to excavate at a new site. These may include a Syrian shortage of available government staff for placing the required permanent representative at every dig; and also the belief on the part of some that no new digs should be allowed unless the site is threatened (Matthews 2003). Remote Sensing: What Are the Chances That We Will Ever Find the Tower and City of Babel? As outlined in this paper, we have a fair idea where we should look for Babel. But it will still take a search mission to actually find it. Archaeological remote sensing allows large regions to be rapidly investigated for archaeological features, at relatively low cost; it can detect features unseen on the surface, precisely map them, and offer interpretations based on their form, distribution, and context. In short, archaeological remote sensing may offer the only pragmatic means to locate, map, and inventory much of the world’s archaeological resources. For an excellent history and overview of the subject of satellite remote sensing, and discussion of at least a dozen different satellite image types, see Parcak (2009). Menze, Muhl and Sherratt (2007) discuss the detection of North Mesopotamian tell sites as low as 6 m (19 ft) high by satellite remote sensing. A recent technology using satellite QuickBird imagery has been useful in locating underground archaeological remains (Masini and Lasaponara 2007). Of special interest is that Masini and Lasaponara have analyzed QuickBird data to produce a detailed visualization of a large buried pyramid near the Cahuachi archaeological site in Peru (Lorenzi 2008). High-resolution Google Earth satellite imagery has become a useful and inexpensive tool for archaeologists; it is being used at Tell Brak, for example (Jarus 2009). We could expect from the above discussion that the area where the Tower and City remnants lie might be visible by satellite photography because baked brick is quite different in consistency and composition from soil, and is easier to see than mudbrick structures, which do not differentiate from the surrounding soil as easily. It will be easier to spot the Tower site if the Tower foundation is not very far below the surface, or if there are some ruins above ground. With these modern remote sensing tools at hand, we can say that the chances of locating the actual Babel site are higher than they might have been in the past. It has been shown in this paper that, based on biblical, historical, geological, and geographical evidences, the Tower of Babel was most likely built in the Khabur River triangle of North Syria, somewhere inside a triangle marked at its points by Tell Brak, Tell Aqab (near Amuda) and Tell Fakhariyah; and could not have been located anywhere in southern Mesopotamia, as has been traditionally believed. There is a possibility that we may yet find the actual site of the Tower of Babel, but this will require further research as well as onsite archaeological excavation. Ainsworth, W. F. 1874. A commentary on the anabasis of Xenophon. In The anabasis, or expedition of Cyrus, and the memorabilia of Socrates. Trans. J. S. Watson. New York, New York: Harper and Brothers. Akkad. 2000. A dictionary of world history. Retrieved from Encyclopedia.com at http://www.encyclopedia.com/doc/1O48-Akkad.html on August 29, 2010. Akkermans, P. M. M. G. and G. M. Schwartz. 2003. The archaeology of Syria: From complex hunter-gatherers to early urban societies (ca 16,000–300 BC). Cambridge, England: Cambridge University Press. Al Hillah. 2010. Weather forecast for Al Hillah in Babil (Iraq), 26 m. Retrieved from http://www.yr.no/place/Iraq/Babil/Al_Hillah/ on August 29, 2010. Albright, W. F. 1924. Shinar–Sangar and its monarch Amraphel. The American Journal of Semitic Languages and Literatures 40, no. 2:125–133. Albright, W. F. 1944. The end of “Calneh in Shinar.” Journal of Near Eastern Studies 3:25–55. Aling, C. G. 2004. Cultural change and the confusion of language in ancient Sumer. Bible and Spade 17, no. 1:1–7. Alley, R. B., P. U. Clark, P. H. Huybrechts, and I. Joughin. 2005. Ice-sheet and sea-level changes. Science 310, no. 5747:456–460. Alphabetical listing of places in Turkey. 2010. Falling Rain Genomics, Inc. Retrieved from http://www.fallingrain.com/world/TU/a/U/r/ on August 29, 2010. Aqrawi, A. A. M., J. Domas, and S. Z. Jassim. 2006. Quaternary deposits. In Geology of Iraq, eds. S. Z. Jassim and J. C. Goff, pp. 185–197. Brno, Czech Republic: Dolin, Prague and Moravian Museum. Aramaic. 2008. The Columbia encyclopedia, 6th ed. Retrieved from Encyclopedia.com at http://www.encyclopedia.com/topic/Aramaic.aspx on August 29, 2010. Arnold, B. T. 2004. Who were the Babylonians? Atlanta, Georgia: Society of Biblical Literature. Ashton, J. and D. Down. 2006. Unwrapping the Pharaohs. Green Forest, Arkansas: Master Books. Astour, M. C. 1968. Mesopotamian and Transtigridian place names in the Medinet Habu lists of Ramses III. The Journal of the American Oriental Society 88, no. 4:733–752. Astour, M. C. 1992. The North Mesopotamian kingdom of Ilansura. In Mari in retrospect: Fifty years of Mari and Mari studies, ed. G. D. Young, pp. 1–34. Winona Lake, Indiana: Eisenbrauns. Astour, M. C. 1993. Tall al-Hamidiya 2. The Journal of the American Oriental Society 113, no. 1:112–115. Retrieved from http://findarticles.com/p/articles/mi_go2081/is_n1_v113/ai_n28627419/ on August 29, 2010. Ataturk Dam. 2010. Wikipedia. Retrieved from http://en.wikipedia.org/wiki/Atat%C3%BCrk_Dam on August 29, 2010. Bailey, G. 2004. World prehistory from the margins: The role of coastlines in human evolution. Journal of Interdisciplinary Studies in History and Archaeology 1, no. 1:39–50. Ball, C. J. 1895. The name Shinar, Genesis XI. Proceedings of the Society of Biblical Archaeology 17:130. Barnes, A. 1855. Notes, critical, explanatory, and practical on the book of Isaiah, new improved edition, vol. 1. New York, New York: Leavitt and Allen. Barton, G. A. 1923. Review (untitled). Journal of the American Oriental Society 43:251–253. Beke, C. T. 1834. Origines biblicae, or Researches in primeval history, vol. 1. London, England: Parbury, Allen, and Co.
Benner, J. A. 2006. Name of the month—Babel. Ancient Hebrew Research Center biblical Hebrew e-Magazine Issue 024. Retrieved from http://www.ancient-hebrew.org/emagazine/024.pdf on August 29, 2010. Blackburn, M. and M. Fortin. 1994. Geomorphology of Tell ‘Atij, Northern Syria. Geoarchaeology 9, no. 1:57–74. Boesch, H. H. 1939. El-‘Iraq. Economic Geography 15, no. 4:325–361. Bonomi, J. 1853. Nineveh and its palaces, 2nd ed. London, England: Ingram, Cooke & Co.
Borsippa. 2010. Wikipedia. Retrieved from http://en.wikipedia.org/wiki/Borsippa on January 13, 2011. Boscawen, W. S. C. 1903. The first of empires, “Babylon of the Bible” in the light of latest research. London, England and New York, New York: Harper & Brothers. Bostock, J. and H. T. Riley, trans. 1893. The natural history of Pliny, vol. I. London, England and New York, New York: George Bell & Sons. Brenton, L. C. L. 2009. The Septuagint with Apocrypha: Greek and English. Peabody, Massachusetts: Hendrickson Publishers. Originally published 1851, London, England: Samuel Bagster & Sons, Ltd.
Bromiley, G. W. 1979. International standard Bible encyclopedia: A–D, vol. 1. Grand Rapids, Michigan: Wm B. Eerdmans Publishing. Brown, D. D., S. R. Driver, and C. A. Briggs. 1907. A Hebrew and English lexicon. Boston, Massachusetts and New York, New York: Houghton Mifflin Company. Buccellati, G. and M. Kelly-Buccellati. 1995. The royal storehouse of Urkesh: The glyptic evidence from the southwestern wing. Berlin, Wien: Archiv fur Orientforschung. Retrieved from http://128.97.6.202/attach/Buccellati%201996%20The%20Royal%20Storehouse%20of%20Urkesh/Buccellati%201996%20The%20Royal%20Storehouse%20of%20Urkesh.pdf on August 29, 2010. Burgess, H. ed. 1857. The journal of sacred literature and biblical record, vol. v. London, England: Alexander Heylin. Carstens, H. 2006. Country profile: Encouraging exploration. GEO ExPro 3:16–20. Cattermole, P. J. and P. Moore. 1985. The story of the earth. Cambridge, England: Press Syndicate of the University of Cambridge. Chesney, F. R. 1868. Narrative of the Euphrates expedition 1835, 1836, 1837. London, England: Longmans, Green, and Co.
Cheyne, T. K. 1899. Babel, Babylon. In Encyclopaedia biblica; a critical dictionary of the literary, political and religious history, the archaeology, geography, and natural history of the Bible, eds. T. L. Cheyne and K. S. Black. New York, New York: MacMillan Company. Chichen Itza. 2010. Wikipedia. Retrieved from http://en.wikipedia.org/wiki/Chichen_Itza on August 29, 2010. Chittick, D. E. 2006. The puzzle of ancient man, 3rd ed. Newberg, Oregon: Creation Compass. Chogha Zanbil. 2009. Historical Iranian sites and people. Retrieved from http://www.google.com/imgres?imgurl=http://corsodireligione.it/digiland/ziggurat.jpg&imgrefurl=http://historicaliran.blogspot.com/2009/12/chogha-zanbil.html&h=334&w=520&sz=39&tbnid=oLtzb8YsBjISyM:&tbnh=84&tbnw=131&prev=/images%3Fq%3DChogha%2BZanbil&usg=__BrJ4X-xspwWvdbGU2Jnnre1yKgQ=&sa=X&ei=co1CTO62LYGB8gaKmKQF&ved=0CBYQ9QEwAA on August 29, 2010. Çiner, A. 2004. Turkish glaciers and glacial deposits. In Quaternary glaciations—Extent and chronology, vol. 1, eds. J. Ehlers and P. S. Gibbard, pp. 419–429. Amsterdam, The Netherlands: Elsevier B.V.
Clark, P. U. and A. C. Mix. 2002. Ice sheets and sea level of the Last Glacial Maximum. Quaternary Science Reviews 21, nos. 1–3:1–7. Compare Translations. 2010. Bible study tools. Retrieved from http://www.biblestudytools.com/genesis/11-2-compare.html on August 29, 2010. Cooke, G. A. 1987. Reconstruction of the Holocene coastline of Mesopotamia. Geoarchaeology 2, no. 1:15–28. Cooper, B. 1995. After the Flood. Chichester, England: New Wine Press. Cornuke, B. 2008. Noah’s Ark. Bible archaeology search and exploration institute. Retrieved from http://www.baseinstitute.org/index.php?option=com_content&view=article&id=51&Itemid=65 on August 29, 2010. Courville, D. 1971. The Exodus problem and its ramifications: A critical examination of the chronological relationships between Israel and the contemporary peoples of antiquity, two volumes. Loma Linda, California: Challenge Books. Crawford, H. 2004. Sumer and the Sumerians, 2nd ed. Cambridge, United Kingdom: Cambridge University Press. Ctesiphon. 2010. Wikipedia. Retrieved from http://en.wikipedia.org/wiki/Ctesiphon on August 29, 2010. Cuozzo, J. W. 1998. Buried alive. Green Forest, Arkansas: Master Books. Dalley, S. 1984. Mari and Karana: Two old Babylonian cities. London, England: Longman Group. Dalley, S. 2008. Babylon as a name for other cities including Nineveh. In Proceedings of the 51st Rencontre Assyriologique Internationale, eds. R. D. Biggs, J. Myers, and M. T. Roth, pp. 25–33. Chicago, Illinois: The Oriental Institute of the University of Chicago. Daniel 1. Living IN the World but not OF the World. 2007. Walk with the Word. Retrieved from http://walkwiththeword.org/index.html on August 29, 2010. Das, R. K. 2001. Temples of Tamilnad, 3rd ed. Mumbai, India: Bharatiya Vidya Bhavan. Davidson, T. E. and T. Watkins. 1981. Two seasons of excavation at Tell Aqab in the Jezirah, N. E. Syria. Iraq 43, no. 1:1–18. Deckers, K. and S. Riehl. 2004. The development of economy and environment from the Bronze Age to the Early Iron Age in Northern Syria and the Levant. A case-study from the Upper Khabur region. Antiquity 78, issue 302. Retrieved from http://www.antiquity.ac.uk/projgall/deckers302/ on August 29, 2010. Deckers, K. and S. Riehl. 2007. Fluvial environmental contexts for archaeological sites in the Upper Khabur basin (northeastern Syria). Quaternary Research 67, no. 3: 337–348. Dillmann, A. 1897. Genesis, critically and exegetically expounded, vol. 1. Edinburgh, Scotland: T & T Clark. Dirven, L. 1999. The Palmyrenes of Dura-Europos: A study of religious interaction in Roman Syria. Leiden, The Netherlands: K. Brill. Drijvers, H. J. W. 1980. Cults and beliefs at Edessa. Leiden, The Netherlands: E. J. Brill. Duncan, G. S. 1915. The Sumerian inscriptions of Sin-Gâšid, king of Erech, transliterated, translated, and annotated. The American Journal of Semitic Languages and Literatures 31, no. 3:215–221. East Africa. 2004. World reference atlas, ed. A. Heritage. New York, New York: Dorling Kindersley Publishing. Ebeling, E., B. Meissner, and D. O. Edzard. 2001. Reallexikon der Assyriologie, vol. 9. Berlin, Germany: Walter de Gruyter. Eidem, J. and D. Warburton. 1996. In the land of Nagar: A survey around Tell Brak. Iraq 58:51–64. Epic of Gilgamesh. 2010. Wikipedia. Retrieved from http://en.wikipedia.org/wiki/Epic_of_Gilgamesh on August 30, 2010. Faber, G. S. 1816. The origin of pagan idolatry ascertained from historical testimony and circumstantial evidence, vol. III. London, England: F. C. and J. Rivington. Fasold, D. 1988. The Ark of Noah. New York, New York: Wynwood Press. Finegan, J. 1979. Archaeological history of the ancient Middle East. Boulder, Colorado: Westview Press. Fischer, R. J. 2008. Historical Genesis: From Adam to Abraham. Lanham, Maryland: University Press of America. Fletcher, J. P. 1850. Narrative of a two years’ residence at Nineveh and travels in Mesopotamia, Assyria and Syria, vol. II, 2nd ed. London, England: Henry Colburn, Publisher. Fraser, J. 1834. Universal history. Fraser’s Magazine for Town and Country 10, no. 15:210–221. Fraser, J. B. 1842. Mesopotamia and Assyria from the earliest ages to the present time. New York, New York: Harper and Brothers. Gelb, I. J. 1935. Calneh. The American Journal of Semitic Languages and Literatures 51, no. 3:189–191. Gelb, I. J. 1937. Shanhar. The American Journal of Semitic Languages and Literatures 53, no. 4:253–255. Gelb, I. J. 1955. The name of Babylon. Journal of the Institute of Asian Studies 1:1–4. Gemser, B. 1968. Adhuc loquitur: Collected essays of Dr. B. Gemser. Leiden, Netherlands: E. J. Brill. Genesis. 2009. New American Bible. Retrieved from http://www.usccb.org/nab/bible/genesis/genesis11.htm on August 30, 2010. Goodspeed, G. S. 1902. A history of the Babylonians and Assyrians. New York, New York: Charles Scribner’s Sons. Gopuram. 2010. Wikipedia. Retrieved from http://en.wikipedia.org/wiki/Gopuram on August 30, 2010. Gornitz, V. 2007. Sea level rise, after the ice melted and today. National Aeronautics and Space Administration: Goddard Institute for Space Studies. Retrieved from http://www.giss.nasa.gov/research/briefs/gornitz_09/ on August 30, 2010. Graham, C. C. 1859. The ancient Bashan and the cities of Og. In Living Age, vol. 62, eds. E. Littell and R. S. Littell, pp. 70–90. Boston, Massachusetts: Littell, Son, and Company. Grant, M. 1997. A guide to the ancient world. New York, New York: Barnes & Noble Books. Greenfield, J. C. and A. Shaffer. 2001. Notes on the Akkadian-Aramaic bilingual statue from Tell Fekherye. In `Al Kanfei Yonah: Collected studies of Jonas C. Greenfield on Semitic philology, eds. S. M. Paul, M. E. Stone, and A. Pinnick, pp. 217–262. Jerusalem, Israel: The Hebrew University Magnes Press. Grimston, J. 1999. Tower of Babel is ‘found’ near the Black Sea. The Sunday Times (of London, England), April 4. Retrieved from http://www.biblemysteries.com/pressarticles/londontimes3.htm on August 30, 2010. Guest, E. R. 1953. The Rustam Herbarium, ‘Iraq: Part VI. General and ecological account. Kew Bulletin 8, no. 3: 383–403. Habermehl, A. 2008. A review of the search for Noah’s Ark. In Proceedings of the sixth international conference on creationism, ed. A. A. Snelling, pp. 485–501. Pittsburgh, Pennsylvania: Creation Science Fellowship. Also online at www.harpanddragon.com/ICC6-41.pdf. Habermehl, A. 2010. Those enigmatic Neanderthals: What are they saying? Are we listening? Answers Research Journal 3:1–21. Habermehl, H. A. 1995. God has spoken but what has He said? Cortland, New York: Antiphon Books. Halley, H. H. 1965. Halley’s Bible handbook. Grand Rapids, Michigan: Zondervan Publishing House. Hamblin, W. J. 2006. Warfare in the ancient Near East to 1600 BC. New York, New York: Routledge. Hanebuth, T. J. J., K. Stattegger, and A. Bojanowski. 2009. Termination of the last glacial maximum sea-level lowstand: The Sunda-Shelf data revisited. Global and Planetary Change 66, nos. 1–2:76–84. Harrison, R. K. 1963. Babylon. In Zondervan pictorial Bible dictionary, ed. M. C. Tenney. Grand Rapids, Michigan: Zondervan Publishing House. Hastings, J., A. B. Davidson, and J. A. Selbie. 1902. A dictionary of the Bible: Volume IV (Pleroma–Zuzim). New York, New York: Charles Scribner’s Sons. Hastings, J. 2004. A dictionary of the Bible: Volume I (Part I: A–Cyrus). The Minerva Group. Heinz, M. 2007. Sargon of Akkad: rebel and usurper in Kish. In Representations of political power: Case histories from times of change and dissolving order in the Ancient Near East, pp. 67–86, eds. M. Heinz and M. H. Feldman. Winona Lake, Indiana: Eisenbrauns. Held, C. C. 2000. Middle East patterns, 3rd ed. Boulder, Colorado: Westview Press. Henry, M. 1992. The NIV Matthew Henry commentary in one volume, eds. L. F. Church and G. W. Peterman. Grand Rapids, Michigan: Zondervan Publishing House. Henry, R. 2003. Synchronized chronology: Rethinking Middle East antiquity. New York, New York: Algora Publishing. Heritage, A., ed. 2004. World reference atlas. New York, New York: Dorling Kindersley Publishing. Herz, N. and E. G. Garrison. 1998. Geological methods for archaeology. New York, New York: Oxford University Press. Heyerdahl, T., D. H. Sandweiss, and A. Narváez. 1995. Pyramids of Tucúme. New York, New York: Thames and Hudson. Hickman, D. 1986. The dating of Hammurabi. In Proceedings of the third seminar of catastrophism and ancient history, ed. M. A. Luckerman, pp. 13–28. Los Angeles, California: Catastrophism and Ancient History Press. Hirsch, S. R. 1989. The Pentateuch. Volume I: Genesis, 2nd ed., trans. I. Levy. Gateshead, England: Judaica Press. Hislop, A. 1903/2007. The two Babylons. This edition originally published 1903, republished 2007. New York, New York: Cosimo. Hittite Period. 2006. Map of Hittite kingdom. Retrieved from http://www.ancientanatolia.com/historical/hittite_period.html on January 12, 2011. Hogg, H. W. 1911. Mesopotamia. Encyclopaedia Britannica. Cambridge, England: University Press. Holt, R. D. 1996. Evidence for a late Cainozoic Flood/post-Flood boundary. CEN Technical Journal 10, no. 1:128–167. Howard, M. L. 2009. Therefore it was called Babel. Journal of Creation 23, no. 3:56–57. Huehnergard, J. 1986. Review of: La statue de Tell Fekherye et son inscription bilingue assyro-araméenne by A. Abou-Assaf, P. Bordreuil, and A. R. Millard. Bulletin of the American Schools of Oriental Research 261:91–95. Huot, J.-L. 1992. The first farmers at Oueili. The Biblical Archaeologist 55, no. 4:188–195. Imbrie, J. and K. P. Imbrie. 1979. Ice ages: Solving the mystery. Berkeley Heights, NJ: Enslow Publishers. Ionides, M. G. 1954. Correspondence: The geographical history of the Mesopotamian plains. The Geographical Journal 120, no. 3:394–397. Iraq. 2003. Map of Iraq. Union, New Jersey: Hammond World Atlas Corporation. Jarus, O. 2009. Google’s satellite revolution. Retrieved from http://heritage-key.com/world/googles-satellite-revolution on February 4, 2011. Jassim, S. Z. and T. Buday. 2006. Units of the stable shelf. In Geology of Iraq, eds. S. Z. Jassim and J. C. Goff, pp. 57–70. Brno, Czech Republic: Dolin, Prague and Moravian Museum. Jastrow, M. 1915. The civilization of Babylonia and Assyria: Its remains, language, history, religion, commerce, law, art, and literature. Philadelphia, Pennsylvania, and London, England: J.B. Lippincott Company. Johns, C. H. W. 1913. Ancient Babylon. New York: G. P. Putnam’s Sons. Jones, A. 1856. The proper names of the Old Testament Scriptures. London, England: S. Bagster and Sons. Reprinted 1990 as Jones’ dictionary of Old Testament proper names. Grand Rapids, Michigan: Kregel Publications. Jones, A. T. 1897. The empires of the Bible from the confusion of tongues to the Babylonian captivity. Battle Creek, Michigan: Review and Herald Publishing Company. Jones, F. N. 2007. The chronology of the Old Testament, 16th ed. Green Forest, Arkansas: Master Books. Jordan, J. A. 2007. The handwriting on the wall: A commentary on the book of Daniel. Powder Springs, Georgia: American Vision. Josephus, F. 1736a. The antiquities of the Jews. In The works of Josephus, trans. W. Whiston, 1987 ed. Peabody, Massachusetts: Hendrickson Publishers. Josephus, F. 1736b. Flavius Josephus against Apion. In The works of Josephus, trans. W. Whiston, 1987 ed. Peabody, MA: Hendrickson Publishers. Kalimi, I. 2000. Shinar. In Eerdmans dictionary of the Bible, eds. D. N. Freedman, A. C. Myers, and A. B. Beck. Grand Rapids, Michigan: Wm. B. Eerdmans Publishing Co.
Kallai, Z., 2000. In Studies in historical geography and biblical historiography, eds. G. Galil and M. Weinfeld. Leiden, The Netherlands: Koninklyke Brill. Kenett, R. S. 1995. Managing for quality in ancient Israel. In A history of managing for quality: The evolution, trends, and future directions of managing for quality, ed. J. M. Juran. Milwaukee, Wisconsin: ASQC Quality Press. Kennedy, W. J. and G. Lunn. 2000. Upper Campanian (Cretaceous) ammonites from the Shinarish Formation, Djebel Sinjar, Northwest Iraq. Journal of Paleontology 74, no. 3:464–473. Kerr, R. A. 1998. Sea-floor dust shows drought felled Akkadian empire. Science 279, no. 5349:325–326. Khabur River. 2010. Wikipedia. Retrieved from http://en.wikipedia.org/wiki/Khabur_River on August 29, 2010. Khabur (Tigris). 2009. Wikipedia. Retrieved from http://en.wikipedia.org/wiki/Khabur_%28Tigris%29 on August 30, 2010. Kidner, D. 1967. Genesis: An introduction and commentary. London, England: The Tyndale Press. Killean, C. 2004. Arabic. Encyclopedia of the modern Middle East and North Africa. Retrieved from Encyclopedia.com at http://www.encyclopedia.com/doc/1G2-3424600277.html on August 30, 2010. Kitto, J. 1904. Illustrated history of the Bible. Hartford, Connecticut: S.S. Scranton Company. Kolinski, R. 2007. Upper Khabur region in the second part of the third millennium BC. Altorientalische Forschungen 34, no. 2:342–369. Koutoupis, P. 2009. What is the land of Shinar and where is it located? Retrieved from http://www.petroskoutoupis.com/lib/ShinarLocation.pdf on August 30, 2010. Kuhrt, A. 1995. The ancient Near East, c. 300–330 BC, vol. I. London, England: Routledge. Kurter, A. 1988. Glaciers of the Middle East and Africa—Glaciers of Turkey. In Satellite image atlas of glaciers of the world, eds. R. S. Williams, Jr. and J. G. Ferrigno. Washington, District of Columbia: United States Government Printing Office. Retrieved on January 18, 2011, from http://pubs.usgs.gov/pp/p1386g/turkey.pdf. Kvamme, K. L. 2005. Terrestrial remote sensing in archaeology. In Handbook of archaeological methods, vol. 1, eds. D. G. Maschner and C. Chippindale. Lanham, Maryland: Altamira Press. Lambeck, K. 1996. Shoreline reconstructions for the Persian Gulf since the last glacial maximum. Earth and Planetary Science Letters 142, no. 1–2:43–57. Lambeck, K., Y. Yokohama, P. Johnston, and A. Purcell. 2000. Global ice volumes at the Last Glacial Maximum and early Late glacial. Earth and Planetary Science Letters 181: 513–527. Retrieved from http://people.rses.anu.edu.au/lambeck_k/pdf/211.pdf on January 14, 2011. Larsen, C. E. 1975. The Mesopotamian delta region: A reconsideration of Lees and Falcon. Journal of the American Oriental Society 95, no. 1:43–57. Larsen, C. E. and G. Evans. 1978. The Holocene geological history of the Tigris-Euphrates-Karun delta. In The environmental history of the Near and Middle East since the last ice age, ed. W. C. Brice, pp. 227–244. London, England: Academic Press. Lasor, W. S. 1988. International standard Bible encyclopedia (illustrated in four volumes). Volume four: Q–Z, ed. G. W. Bromiley. Grand Rapids, Michigan: Wm. B. Eerdmans Publishing Co.
Lawler, A. 2009. The dawn of civilization: Writing, urban life, and warfare. Discover Magazine December 2009 issue. Published online February 3, 2010. Retrieved from http://discovermagazine.com/2009/dec/03-dawn-of-civilization-writing-urban-life-warfare on August 30, 2010. Lees, G. M. and N. L. Falcon. 1952. The geographical history of the Mesopotamian plains. The Geographical Journal 118, no. 1:24–39. Leick, G. 2002. Mesopotamia: The invention of the city. London, England: Penguin Books. Levin, Y. 2002. Nimrod the mighty, king of Kish, king of Sumer and Akkad. Vetus Testamentum 52, no. 3:350–366. Lipinski, E. 2000. The Aramaeans: Their ancient history, culture, religion. Leuven, Belgium: Peeters Publishers & Department of Oriental Studies. Livingston, D. 2008. Search for the Tower of Babel. Online article. Retrieved from http://www.answersingenesis.org/articles/am/v3/n2/search-for-babel on August 30, 2010. Lloyd, S. 1955. Foundations in the dust. Harmondsworth, England: Penguin Books. First published Oxford University Press 1947. Loftus, W. K. 1857. Travels and researches in Chaldea and Susiana. London, England: James Nisbet and Co.
Lorenzi, R. 2008. Ancient Peru pyramid spotted by satellite. Discovery News. Retrieved from http://www.msnbc.msn.com/id/27010998/ on August 30, 2010. Lowy, A. 1893. The Tower of Babel. In Proceedings of the Society of Biblical Archaeology, November 1892 to June 1893, vol. 15, twenty-third session. London (Bloomsbury) England: The Offices of the Society. Mackintosh, C. H. 1972. Genesis to Deuteronomy: Notes on the Pentateuch. Neptune, New Jersey: Loizeaux Brothers. Maisels, C. K. 1993. The Near East: Archaeology in the ‘cradle of civilization.’ London, England: Routledge. Margueron, J.-C. 1965. Mesopotamia, trans. H. S. B. Harrison. Cleveland, Ohio, and New York, New York: The World Publishing Company. Masini, N. and R. Lasaponara. 2007. Investigating the spectral capability of QuickBird data to detect archaeological remains buried under vegetated and not vegetated areas. Journal of Cultural Heritage 8, no. 1:53–60. Master, S. 2002. Umm al Binni lake, a possible Holocene impact structure in the marshes of southern Iraq: Geological evidence for its age, and implications for Bronze-age Mesopotamia. Online abstract, retrieved from http://atlas-conferences.com/cgi-bin/abstract/caiq-15 on August 30, 2010. Matthews, R. 2003. The archaeology of Mesopotamia: Theories and approaches. London, England: Routledge. McIntosh, J. R. 2005. Ancient Mesopotamia: New perspectives. Santa Barbara, California: ABC–CLIO. Menze, B. H., J. A. Ur, and A. G. Sherratt. 2006. Detection of ancient settlement mounds: Archaeological survey based on the SRTM Terrain Model. Photogrammetric Engineering & Remote Sensing 72, no. 3:321–27. Menze, B. H., S. Muhl, and A. G. Sherratt. 2007. Virtual survey on North Mesopotamian tell sites by means of satellite remote sensing. In Broadening horizons: Multidisciplinary approaches to landscape study, eds. B. Ooghe and G. Verhoeven, pp. 5–29. Newcastle-Upon-Tyne, United Kingdom: Cambridge Scholars Publishing. Michalowski, P. 2003. An early dynastic tablet of ED Lu A from Tell Brak (Nagar). Cuneiform Digital Library Journal, no. 3:1–6. Retrieved from http://cdli.ucla.edu/pubs/cdlj/2003/cdlj2003_003.pdf on August 30, 2010. Millard, A. R. 2000. Fekheriyeh, (Tell). In Dictionary of the ancient Near East, eds. P. Bienkowski and A. R. Millard. London, England: British Museum Press and Philadelphia, Pennsylvania: University of Pennsylvania Press. Miller, J. A. 1996. Carchemish. In International dictionary of historic places: Middle East and Africa, vol. 4, eds. K. A. Berney and T. Ring, pp. 173–76. Chicago, Illinois: Fitzroy Dearborn Publishers. Mitchell, T. C. 1991. The Babylonian exile and the restoration of the Jews in Palestine (586–c. 500 BC). In The Cambridge ancient history, Part 2, The Assyrian and Babylonian empires and other states of the Near East, from the eighth to the sixth centuries BC, eds. J. Boardman, I. E. S. Edwards, E. Sollberger, and N. G. L. Hammond, pp. 410–440. Cambridge, United Kingdom: University Press. Mitchell, T. 2005. The vowel points of the Hebrew text of the Old Testament. Retrieved from http://www.firstbaptistgranitefalls.org/pdf/VowelPoints.pdf on August 30, 2010. Mitrovica, J. X. 2003. Recent controversies in predicting post-glacial sea-level change. Quaternary Science Reviews 22, nos. 2–4:127–133. Moore, A. M. T. 1978. The Neolithic of the Levant. Ph.D. diss., Oxford University. Retrieved from http://ancientneareast.tripod.com/71.html on August 30, 2010. Moore, A. M. T. 1988. The prehistory of Syria. Bulletin of the American Schools of Oriental Research, 270:3–2. Morris, H. M. 1966. World population and Bible chronology. Creation Research Society Quarterly 3, no. 3:7–10. Muller, R. A. and G. J. MacDonald. 2000. Ice Ages and astronomical causes: Data, spectral analysis and mechanisms. London, England: Springer. NETS. 2007. A new English translation of the Septuagint, eds. A. Pietersma and B. G. Wright. New York, New York: Oxford University Press. Northern Africa. 1962. In The university atlas, 10th ed., eds. H. Fullard and H. C. Darby. London, England: George Philip and Son, Ltd.
Nilsson, M. P. 1928. The Minoan-Mycenaean religion and its survival in Greek religion, 2nd rev. ed. New York, New York: Biblo and Tannen. Nutzel, W. 1979. On the geographical position of as yet unexplored early Mesopotamian cultures: Contribution to the theoretical archaeology. Journal of the American Oriental Society 99, no. 2:288–296. Oard, M. 1993. Life in the great Ice Age. Green Forest, Arkansas: Master Books. Oard, M. 1990. An Ice Age caused by the Genesis Flood. Green Forest, Arkansas: Master Books. Oard, M. 2004. Frozen in time. Green Forest, Arkansas: Master Books. Oard, M. 2006. Where does the Ice Age fit? In The New Answers Book, ed. K. Ham, pp. 207–219. Green Forest, Arkansas: Master Books. Retrieved from http://www.answersingenesis.org/articles/nab/where-does-ice-age-fit on January 20, 2011. Oates, J. 1979. Babylon. London, England: Thames and Hudson Ltd.
Oates, J. 2004. Archaeology in Mesopotamia: Digging deeper at Tell Brak. Albert Reckitt Archaeological Lecture, British Academy. Retrieved from http://www.mcdonald.cam.ac.uk/projects/brak/BAlect.htm on August 30, 2010. Oates, J., A. McMahon, P. Karsgaard, L. Al Quntar, and J. Ur. 2007. Early Mesopotamian urbanism: A new view from the north. Antiquity 81, no. 313:585–600. Oates, J. and A. McMahon. 2008a. Tell Brak—ancient Nagar: The investigation of urban growth and administration in Northern Mesopotamia. Retrieved from http://www.mcdonald.cam.ac.uk/projects/brak/index.htm on August 30, 2010. Oates, J. and A. McMahon. 2008b. Tell Brak project. Area TW: Archaeological details. Retrieved from http://www.mcdonald.cam.ac.uk/projects/brak/plans.htm on August 30, 2010. Oguchi, T., K. Hori, and C. T. Oguchi. 2008. Paleohydrological implications of late Quaternary fluvial deposits in and around archaeological sites in Syria. Geomorphology 101, no. 1–2:33–43. Olmstead, A. T. 1918. The calculated frightfulness of Ashur Nasir Apal. Journal of the American Oriental Society 38:209–266. Olmstead, A. T. 1921. Shalmaneser III and the establishment of the Assyrian power. Journal of the American Oriental Society 41:345–382. Oppenheim, A. L. 1964. Ancient Mesopotamia. Chicago, Illinois: The University of Chicago Press. Palmer, D, P. G. Bahn, and J. Tyldesley. 2004. Unearthing the past: The great archaeological discoveries that have changed history. London, England: Mitchell Beazley. Parallel Translations. 2010. Biblos online. Retrieved from http://bible.cc/genesis/11-2.htm on August 30, 2010. Parpola, S. 1987. The Assyrian Empire: State archives of Assyria. Map, printed by the Helsinki University Press. Retrieved from http://aina.org/maps/historic/historic.htm on August 30, 2010. Parcak, S. H. 2009. Satellite remote sensing for archaeology. Abingdon, United Kingdom and New York, New York: Routledge. Parrot, A. 1955. The Tower of Babel. London, England: SCM Press Ltd.
Peltier, W. R. and R. G. Fairbanks. 2006. Global glacial ice volume and Last Glacial Maximum duration from an extended Barbados sea level record. Quaternary Science Reviews 25, nos. 23–24:3322–3337. Pendlebury, J. D. S. 1930. Aegyptiaca. London, England: Cambridge University Press. Persian Gulf Once Dry, Green, and Inhabited by Humans. 2007. Suburban Emergency Management Project. Biot Report #422: May 15, 2007. Retrieved from http://www.semp.us/publications/biot_reader.php?BiotID=422 on August 30, 2010. Pinches, I. A. 1908. A dictionary of the Bible, vol. 1: A—Feasts, eds. J. Hastings and J. A. Selbie. New York, New York: Charles Scribner’s Sons. Pinches, T. G. 1893. Calneh or Calno. In A dictionary of the Bible: Comprising its antiquities, biography, geography, and natural history, vol. 1, part 1, eds. W. Smith and J. M. Fuller. London, England: John Murray. Pinches, T. G. 2010. Amraphel. International standard Bible encyclopedia. Published online by Biblos.com. Retrieved from http://bibleencyclopedia.com/amraphel.htm on January 7, 2011. Poe, E. A. 1845. The Purloined Letter. In Tales by Edgar A. Poe. New York, New York: Wiley and Putnam. Pollock, S. 1999. Ancient Mesopotamia: The Eden that never was. Cambridge, United Kingdom: Cambridge University Press. Postgate, J. N. 1974. Some remarks on conditions in the Assyrian countryside. Journal of the Economic and Social History of the Orient 17, no. 3:225–243. Potts, D. T. 1997. Mesopotamian civilization: The material foundations. London, England: The Athlone Press. Pritchard, J. B. ed. 1950. Ancient Near Eastern texts relating to the Old Testament. Princeton, New Jersey: Princeton University Press. Pyramid of the Moon. 2010. Wikipedia. Retrieved from http://en.wikipedia.org/wiki/Pyramid_of_the_Moon on August 29, 2010. Ragozin, Z. A. 1893. The story of Assyria from the rise of the empire to the fall of Nineveh. New York, New York: G. P. Putnam’s Sons. Rawlinson, G. 1885. The seven great monarchies of the ancient eastern world: Vol. I. New York, New York: John B. Alden. Ray, L. L. 1999. The great Ice Age. U.S. Geological Survey. Retrieved from http://pubs.usgs.gov/gip/ice_age/ice_age.pdf on January 22, 2011. Rendsburg, G. A. 2003. Semitic languages (with special reference to the Levant). In Near eastern archaeology: A reader, ed. S. Richard, pp. 71–73. Winona Lake, Indiana: Eisenbrauns. Ristvet, L. 2008. Legal and archaeological territories of the second millennium BC in northern Mesopotamia. Antiquity 82:585–599. Retrieved from http://leilan.yale.edu/pubs/files/Ristvet_2008_Antiquity.pdf on August 30, 2010. Ristvet, L. and H. Weiss. 2005. The Habur region in the late third and early second millennium BC. In The history and archaeology of Syria, vol. 1., ed. W. Orthmann, pp. 1–26. Saarbrucken, Germany: Saarbrucken Verlag. Retrieved from http://leilan.yale.edu/pubs/files/RistvetWeiss2005HAS1.pdf on August 30, 2010. Rohl, D. 1998. Legend: The Genesis of civilisation. London, England: Century. Rollin, C. 1836. The ancient history of the Egyptians, Carthaginians, Assyrians, Babylonians, Medes and Persians, Macedonians, and Grecians, vol. 2. New York, New York: George Dearborn. Ron Wyatt. 2010. Encyclopedia of creation science. Retrieved August 30, 2010, from http://creationwiki.org/Ron_Wyatt. Ross, A. P. 1985. In The Bible knowledge commentary: An exposition of the Scriptures by Dallas Seminary faculty, eds. J. F. Walvoord and R. B. Zuck, pp. 15–101. Colorado Springs, Colorado: Chariot Victor Publishing. Saggs, H. W. F. 1989. Civilization before Greece and Rome. London, England: B. T. Batsford, and New Haven, Connecticut: Yale University Press. Sanders, S. 2002. New discoveries in Syria confirm theory on spread of early civilization. The University of Chicago News Office. Retrieved from http://www-news.uchicago.edu/releases/02/020531.hamoukar.shtml on August 30, 2010. Sarikaya, M., M. Zreda, and A. Çiner. 2008. Late Quaternary paleoclimates of Turkey from glacial records and their link to the climate change of the past century. American Geophysical Union, Fall Meeting 2008, abstract #PP13B-1440. Sayce, A. H. 1895. Patriarchal Palestine. New York, New York: E. and J. B. Young & Co.
Schaffer, Y. 2000. Changes in the building technology in Israel from ancient times until the 20th century and their influence on everyday life. Lecture. Retrieved from http://www.unesco.org/archi2000/pdf/schaffer.pdf on August 30, 2010. Seely, P. H. 2001. The date of the Tower of Babel and some theological implications. Westminster Theological Journal 63:15–38. Semple, E. C. 1919. The ancient piedmont route of northern Mesopotamia. The Geographical Review 8, no. 3:153–179. Sennar. 1911. In Online Encyclopedia, copyright 2010. Originally in Encyclopedia Britannica 1911, vol. V24, p. 647. Retrieved from http://encyclopedia.jrank.org/SCY_SHA/SENNAR.html on August 30, 2010. Sennar, Sudan. 2009. Collins maps. Retrieved from http://www.collinsmaps.com/maps/Sudan/Sennar/P1052453.aspx on August 30, 2010. Setterfield, B. 2010. The Tower of Babel. Retrieved from http://www.setterfield.org/weeklystudies4.html on April 30, 2010. Siff, M. J. 2006. Tower of Babel. In Encyclopaedia Judaica. Farmington Hills, Michigan: The Gale Group. Singer, C. J. ed. 1954. A history of technology, vol. 1. Oxford, England: Oxford University Press. Smith, W. 1893. A dictionary of the Bible: Comprising its antiquities, biography, geography, and natural history, vol. 3. London, England: John Murray. Smith, W. 1948. A dictionary of the Bible: Comprising its antiquities, biography, geography, natural history and literature with the latest researches and references to the Revised Version of the New Testament, eds. F. N. and M. A. Peloubet. Grand Rapids, Michigan: Zondervan Publishing House. Snelling, A. A. 2009. Earth’s catastrophic past: Geology, creation and the Flood, vol. 2. Dallas, Texas: Institute for Creation Research. Spielvogel, J. J. 2008. Western Civilization, vol. A: To 1500. Stamford, Connecticut: Cengage Learning. Spiers, R. P. 1910. Assyrian architecture. In Encyclopaedia Britannica, vol. 2, 11th ed., ed. H. Chisholm. Cambridge, England: University Press. Stewart, T. T. 2003. Discovery of the true pharaohs of Joseph, Moses and the Exodus Vol. I: Solving the Exodus mystery. Lubbock, Texas: Biblemart.com. Stieglitz, R. R. 1987. Ebla and Dilmun. In Eblaitica: Essays on the Ebla archives and Eblaite language, vol. 1, eds. C. H. Gordon, G. A. Rendsburg, and N. H. Winter, pp. 43–46. Winona Lake, Indiana: Eisenbrauns. Stinehart, J. 2010. Hurrian analysis of “Shinar.” Retrieved from http://lists.ibiblio.org/pipermail/b-hebrew/2010-April/041515.html on August 30, 2010. Stratovolcano. 2009. Wikipedia. Retrieved from http://en.wikipedia.org/wiki/Stratovolcano on August 30, 2010. Strong, J. 1894. The exhaustive concordance of the Bible. New York, New York, and Nashville, Tennessee: Abingdon Press. Sweeney, M. A. 2007. I & II Kings: A commentary. Louisville, Kentucky: Westminster John Knox Press. Sumerian King List. 2010. Wikipedia. Retrieved from http://en.wikipedia.org/wiki/Sumerian_King_List on August 30, 2010. Symmes, P. 2010. A temple complex in Turkey that predates even the pyramids is rewriting the story of human evolution. Newsweek’s Education Site, February 19, 2010. Retrieved from www.newsweek.com/2010/02/18/history-in-the-remaking.html on January 15, 2011. Szuchman, J. J. 2007. Prelude to empire: Middle Assyrian Hanigalbat and the rise of the Aramaeans. Ph.D. diss., University of California. Retrieved from http://szuchman.bol.ucla.edu/Prelude%20To%20Empire.pdf on August 30, 2010. Tell el Fakhariya. 2010. Wikipedia. Retrieved from http://en.wikipedia.org/wiki/Tell_el_Fakhariya on August 29, 2010. The Book of Jubilees. 1913. In The Apocrypha and Pseudepigrapha of the Old Testament, ed. R. H. Charles. Oxford, England: Clarendon Press. Retrieved from http://www.pseudepigrapha.com/jubilees/index.htm on August 30, 2010. The Cursing of Agade. 2006. ETCSL project, Faculty of Oriental Studies, University of Oxford. Retrieved from http://etcsl.orinst.ox.ac.uk/cgi-bin/etcsl.cgi?text=t.2.1.5# on August 30, 2010. The Tower of Babel. 2009. On Art and the Bible website. Retrieved from http://www.artbible.info/art/tower-of-babel.html on August 30, 2010. Tompkins, P. 1976. Mysteries of the Mexican pyramids. New York, New York: Harper & Row. Thompson, J. A. 1971. Samaritan evidence for “All of them in the land of Shinar” (Gen 10:10). Journal of Biblical Literature 90, no. 1:99–102. Toffteen, O. A. 1907. Ancient chronology: Part I. Chicago, Illinois: The University of Chicago Press. Tower of Babel. 2010. Creation Wiki. Retrieved from http://creationwiki.org/Tower_of_Babel on August 30, 2010. Trinkaus, E. 1978. Hard times among the Neanderthals. Natural History 87, no. 10:58–63. Turanian–Sumerian: Anagram Conspiracy. 2009. Retrieved August 30, 2010, from http://www.abovetopsecret.com/forum/thread429985/pg1. U.S. Geological Survey. 2000. Sea level and climate. Retrieved August 30, 2010, from http://pubs.usgs.gov/fs/fs2-00/. Ussher, J. 1658. The annals of the world, rev. Rev. L. and M. Pierce 2003. Green Forest, Arkansas: Master Books. Van de Mieroop, M. 1999. The ancient Mesopotamian city. Oxford, New York: Oxford University Press. van der Toorn, K. and P. W. van der Horst. 1990. Nimrod before and after the Bible. The Harvard Theological Review 83, no. 1:1–29. Vardiman, L. 2001. Climates before and after the Genesis Flood: Numerical models and their implications. El Cajon, California: Institute for Creation Research. Vaux, W. S. W. 1855. Nineveh and Persepolis. London, England: Arthur Hall, Virtue & Co.
Veenhof, K. R. and J. Eidem. 2008. Mesopotamia: the Old Assyrian period. Fribourg, Switzerland: Academic Press, and Göttingen, Germany: Vandenhoeck & Ruprecht. Velikovsky, I. 1952. Ages in chaos. New York, New York: Doubleday. Velikovsky, I. 1999. Hammurabi and the revised chronology. From The Immanuel Velikovsky Archive (published online). Retrieved from http://www.varchive.org/ce/hammurabi.html on January 9, 2011. Wall-Romana, C. 1990. An areal location of Agade. Journal of Near Eastern Studies 49, no. 3:205–245. Walton, J. H. 1995. The Mesopotamian background of the Tower of Babel account and its implications. Bulletin for Biblical Research 5:155–175. Ward, W. H. 1887. Notes on Oriental antiquities: IV. An eye of Nabu; V. A Babylonian pendant; VI. The stone tablet at Abu-Habba. The American Journal of Archaeology and of the History of the Fine Arts 3, no. 3/4:338–343. Watson, J. S. and W. F. Ainsworth. 1894. The anabasis, or expedition of Cyrus, and the memorabilia of Socrates. New York, New York: Harper & Brothers. Webster, N. 1973. Webster’s new twentieth century dictionary of the English language unabridged, 2nd ed., extensively rev., ed. J. L. McKechnie. Cleveland, Ohio and New York, New York: The World Publishing Company. Weiss, H. 1975. Kish, Akkad and Agade. Journal of the American Oriental Society 95, no. 3:434–453. Weiss, H. 2003. Akkadian empire. In Encyclopedia of prehistory: South and southwest Asia, vol. 8, eds. P. N. Peregrine, and M. Ember, pp. 21–23. New York, New York: Springer. Weiss, H., M.-A. Courty, W. Wetterstrom, F. Guichard, L. Senior, R. Meadow, and A. Curnow. 1993. The genesis and collapse of third millennium North Mesopotamian civilization. Science 261, no. 5124:995–1004. Wells, E. 1820. An historical geography of the Old and New Testament: Volume 1. London, England: F. C. and J. Rivington. Wells, H. G. 1922. A short history of the world. New York, New York: Macmillan. Westermann, C. 1984. Genesis 1–11: A continental commentary. Minneapolis, Minnesota: Augsburg Publishing House. Wilkinson, T. J. 2007. Remote sensing and geographical information systems: 1999–2000 annual report, rev. February 23, 2007. The Oriental Institute of the University of Chicago. Retrieved from http://oi.uchicago.edu/research/pubs/ar/99-00/jazira.html on August 30, 2010. Woolley, C. L. 1928. The Sumerians. Oxford: The Clarendon Press. Wright, H. E. 2004. Pleistocene glaciation of Iraq. In Quaternary glaciations: extent and chronology, Part III: South America, Asia, Africa, Australasia, Antarctic, eds. J. Ehlers and P. L. Gibbard. Amsterdam, The Netherlands: Elsevier B. V.
Wright, H. T., E. S. A. Rupley, J. Ur, J. Oates, and E. Ganem. 2006–2007. Preliminary report on the 2002 and 2003 seasons of the Tell Brak sustaining area survey. Les Annales Archéologiques Arabes Syriennes 49–50:7–21. Wyatt, R. E. 1995. Newsletter 13: The Tower of Babel. Anchor Stone International. Retrieved from http://anchorstone.com/wyatt-newsletters/index.php?option=com_content&task=view&id=72&Itemid=39 on February 26, 2011. Wyatt, M. N. n.d. Chapter 1: The biblical account of Babel. Wyatt Archaeological Research. Retrieved from http://www.wyattnewsletters.com/babel/babel01.htm on August 30, 2010. Yahuda, A. S. 1946. Calneh in Shinar. Journal of Biblical Literature 65, no. 3:325–327. Yamauchi, E. M. 1990. Persia and the Bible. Grand Rapids, Michigan: Baker Books. Yates, K. M. 1962. Genesis. In The Wycliffe Bible commentary, eds. C. F. Pfeiffer and E. F. Harrison. Nashville, Tennessee: The Southwestern Company. Zadok, R. 1984. The origin of the name Shinar. Zeitschrift für Assyriologie und Vorderasiatische Archäologie 74, no. 2:240–244. Brenton LXX = The Septuagint with Apocrypha: Greek and English. Listed in the references as Brenton 2009. NETS LXX = A New English translation of the Septuagint. Listed in the references as NETS 2007. NIV = New International Version 1984. “Mesopotamia” means “land between the rivers,” a name coined by the Greeks for the northern territory between the Tigris and Euphrates rivers. Today the term is generally used to include all of Iraq and Northeast Syria (see, for example, Finegan 1979, p. xxiii; Margueron 1965, p. 201; Pollock 1999, p. 1). Babylon is mentioned two other times in Zechariah, but there is no suggestion that these refer to the same place as Shinar, and a different Hebrew word for Babylon is used (Strong 1894, #894). Historical references point to Mount Cudi, sitting just north of the spot where Turkey, Syria, and Iraq meet, as the most likely place where the Ark landed. Although it is traditionally believed that the Ark landed on Mount Ararat in eastern Turkey near the northwestern tip of Iran, geology studies show that Ararat is a young stratovolcano that rose some time after the Flood, and therefore the Ark cannot be there. For a broad review of the entire subject of the search for the Ark, see Habermehl (2008). See Stratovolcano (2009) for a scientific explanation of the formation of this kind of volcano. The assumption here is that the 12th dynasty would have ended with the Exodus in the fifteenth century BC. This topic will be discussed in a forthcoming paper by this author. Biblical scholars are not certain when the final editing of the Old Testament was done. Josephus (1736b, 1:38–41, p. 776) wrote that no changes had been made in Scripture since the days of Artaxerxes (the time of Ezra and Nehemiah); this would have been about 450 BC (Finegan 1979, p. 148). At the height of the Ice Age the ocean was around 120 m (393 ft) lower than it is today, by current widely supported estimates (Bailey 2004; Gornitz 2007; Hanebuth, Stattegger and Bojanowski 2009; Peltier and Fairbanks 2006), although as high as 135 m (442 ft) is cited (Clark and Mix 2002; Mitrovica 2003). Creationists calculate a lower figure of only 50–60 m (164–196 ft) (for example, Snelling 2009, p. 785). See Lambeck (1996) and Cooke (1987) for an overview of post-Ice Age events of the Persian Gulf. Also, Lees and Falcon (1952) claimed in a controversial paper that the head of the Persian Gulf had not been north of its present position in historical times; they said that the widely held belief that incursion of dry land into the Gulf from deposition of sediment by the Tigris and Euphrates rivers was incorrect, because this silting was compensated by simultaneous subsidence of the Mesopotamian trough. Although widely accepted at the time, this thesis appears to have been largely refuted; however, it still lives on (for pro and con on this subject, see for example Ionides 1954; Larsen 1975; Master 2002; Pollock 1999, pp. 34–35). Accad of Genesis 10 is also spelled Akkad(e) and Agade in the literature (Arnold 2004, p. 23); and Archad in the Brenton and NETS LXX. We will use the Akkad spelling in this paper, because it appears to be currently the commonest one. “Tell” is the commonest spelling throughout the Middle East of the Arabic word for a mound that is made up of ancient levels of habitation built on top of each other over time. (Other spelling variants that can be gleaned from the literature include “Tel,” “Tal,” or “Til.”) Although this custom may seem like a strange practice to westerners today, it was the norm throughout the entire Middle East for thousands of years in the past, as evidenced by the vast number of these tells that are visible today (Menze, Ur, and Sherratt 2006). A wadi is defined as a seasonal stream, unlike a river which flows year round. Khabur is the commonest spelling of this river today, and will be used in this paper. A search will find other spellings in the Bible and elsewhere: Chebar (Ezra 1:3), Habor (2 Kings 17:6 and 1 Chronicles 5:26; see also footnote 18), Kabur, Habur, Chaboras, Kebar, and other variants. It should be noted that there is another river by this same name further east, sometimes called the Little Khabur, that flows into the Tigris river at the point where Turkey, Iraq and Syria meet (Khabur (Tigris) 2009). If we shorten the standard timeline by about 500 years, this puts the drought at about the same time that the children of Israel were in Egypt. The necessity of shortening the standard Egyptian timeline will be raised again later in this paper. “Ur” has historically been attached to many place-names in this part of the world; even today, there are over 150 cities in Turkey that begin with “Ur” (Alphabetical listing 2010). Tell Aqab is very near the modern Turkish border. For instance, ancient Umma, the capital of King Lugalzagisi, could well be the little-known Tell Amuda, located on the Turkish side of the border, just north of the modern city of Amuda (Szuchman 2007, p. 78). This would make sense because Lugalzagisi ruled over Erech as well as Umma; and Tell Aqab and this Tell Amuda are not far apart (Hamblin 2006, pp. 64–66). (Tell Shermola, sometimes also called Tell Amuda, located at the city of Amuda itself, is a more recent mound, however, and dates back only to the middle of the second millennium BC at most (Buccellati and Kelly-Buccellati 1995; Szuchman 2007), and therefore could not be the ancient Umma of the Sumerian King List.) In another example, “Kish” could have been the city of Urkish (Urkesh), that is, Kish of Ur, located just east of ancient Amuda/Erech and north of Tell Brak/Akkad; Sargon’s move from his first capital of Kish to Akkad (Heinz 2007) would therefore not have involved a great distance. Eridu, the first city in the King List, could well have been Aridu (Tell Arada) just west of Urakka (see the map by Parpola 1987). These places are all in a fairly small region not far from Tell Brak/Akkad in the Upper Khabur region of North Syria. (a) Both “Calneh” (KJV ) of Genesis 10:10 and “Calno” of Isaiah 10:9 are spelled “Chalanne” in the NETS LXX. However, The Brenton LXX spells it “Chalanne” in Genesis 10:10 and “Chalanes” in Isaiah 10:9. (b) “Canneh” (KJV) of Ezekiel 27:23 is “Chanaa” in the Brenton and “Channa” in the NETS LXX. From ancient sources such as the Greek historian, Xenophon (fourth century BC), it is clear that at that time Arabia was a territory somewhere south of the junction of the Khabur and Euphrates rivers in Syria (Ainsworth 1874, p. 291), and not the territory that we would call Arabia today. Ashton and Down (2006) deal mainly with renovation of the standard Egyptian chronology. However, there are some facts overlooked by them. For instance, on p. 186, they declare Shoshenq’s relief (in the photo) to be unreliable history because the kingdom of Mittani is mentioned, claiming that Mittani had ceased to exist 400 years earlier. In fact, if 500 years are removed from the Mittanian timeline, as per Velikovsky (1952), Mittani is very much in existence at that time. The “Halah” of 2 Kings 17:6 and 18:11 is most likely the mound called Tell Halaf today (see fig. 3); this is because of the accompanying information about Habor (a variant of Khabur) and Gozan. Although the KJV makes it appear that Habor is a city, other translations, such as the NIV, show otherwise: “In the ninth year of Hoshea, the king of Assyria captured Samaria and deported the Israelites to Assyria. He settled them in Halah, in Gozan on the Habor River and in the towns of the Medes.” This fits history, because the city-state of Gozan (or Guzana), was founded at the ancient Tell Halaf site in the tenth century BC, near the Khabur River (Kallai, Galil, and Weinfeld 2000, pp. 95–96; Lipinski 2000, pp. 119–120). Oddly, many scholars locate the Halah of Scripture in a variety of other places (Sweeney 2007, p. 394); this is perhaps why the Bible includes the information about Habor and Gozan to specify geographically which Halah is meant. There are ziggurats in many countries around the world; the author’s personal list currently includes close to 30 countries. The ziggurat at Babylon, rebuilt by Nebuchadnezzar in the sixth century BC (Oates 1979, pp. 261–265) would have dated about 1,700 years after the Babel dispersion by the Ussher chronology; by the LXX chronology, this ziggurat would date over 2,300 years later. The widely known paintings of the Tower of Babel by artists such as Brueg(h)el, Dore, and Valckenborch (The Tower of Babel 2009), have given a popular impression that the Tower was a round, spiral edifice, but there is no evidence to back this. In Genesis 11:8, the Brenton LXX and NETS LXX say “city and tower”; the Masoretic says “city” only. It is surprising how many writers choose to overlook the biblical fact that the brick was baked. For instance, Palmer, Bahn, and Tyldesley (2004, pp. 75–76) quote Genesis 11:3, and then say, “The tower is understood to have been a ziggurat, or stepped, mud-brick temple.” These authors wish to allow the biblical word to mean mud brick, because they can then claim (without offering any evidence) that the Tower of Babel belonged to the time of Nebuchadnezzar (of the sixth century BC), who is known to have built mud-brick ziggurats; and indeed, they declare (again, without evidence) that the original Tower of Babel was the ziggurat called Etemenanki in Babylon. The word “baked” (Strong # 8313) is used consistently throughout the Bible to mean something that is burned, or set on fire, and sun-dried mud brick cannot be the intended meaning here. Based on the Genesis 11 Masoretic genealogy, the Babel dispersion would have taken place about 4,250 years ago. However, the longer LXX genealogy would put the dispersion closer to 4,800 years ago. ISSN: 1937-9056 Copyright © 2011 Answers in Genesis, Inc. All content is owned by Answers in Genesis (“AiG”) unless otherwise indicated. 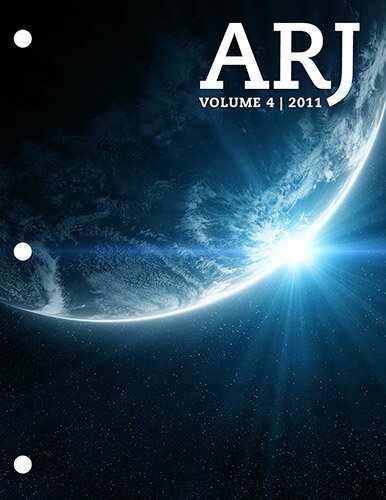 AiG consents to unlimited copying and distribution of print copies of Answers Research Journal articles for non-commercial, non-sale purposes only, provided the following conditions are met: the author of the article is clearly identified; Answers in Genesis is acknowledged as the copyright owner; Answers Research Journal and its website, www.answersresearchjournal.org, are acknowledged as the publication source; and the integrity of the work is not compromised in any way. For website and other electronic distribution and publication, AiG consents to republication of article abstracts with direct links to the full papers on the ARJ website. All rights reserved. For more information write to: Answers in Genesis, PO Box 510, Hebron, KY 41048, Attn: Editor, Answers Research Journal. The views expressed are those of the writer(s) and not necessarily those of the Answers Research Journal Editor or of Answers in Genesis.